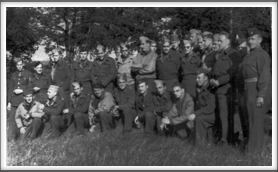 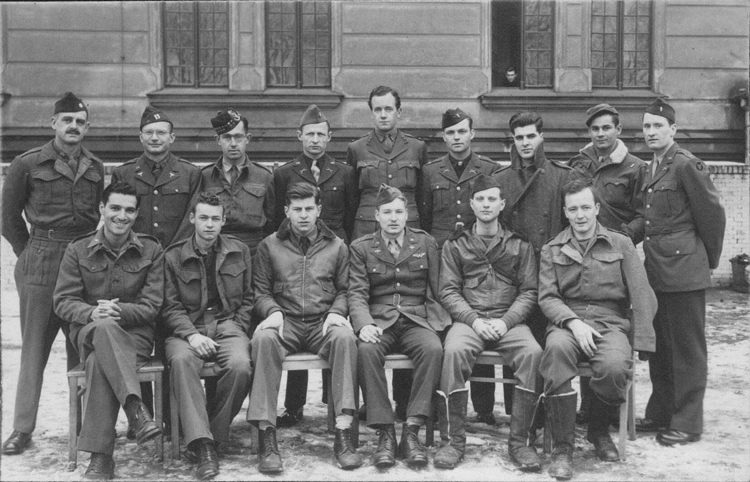 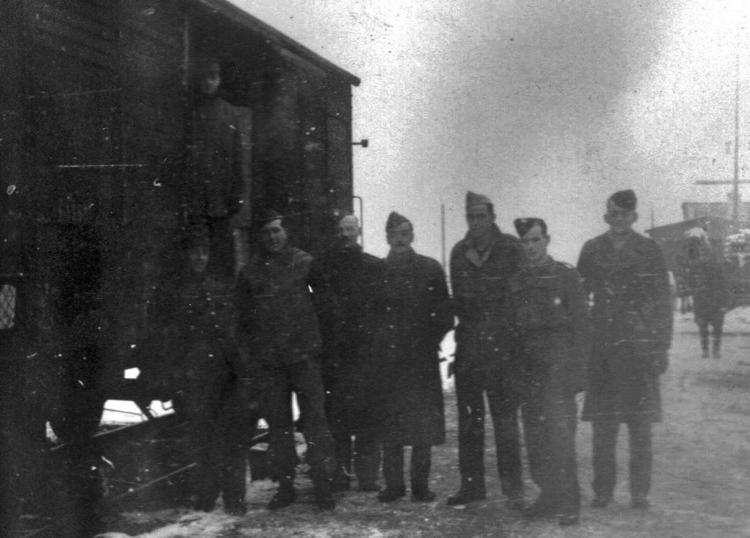 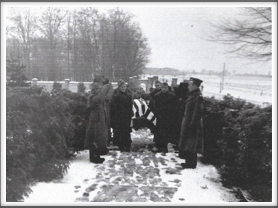 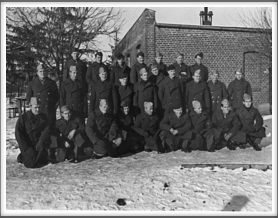 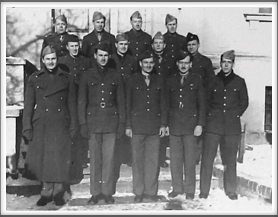 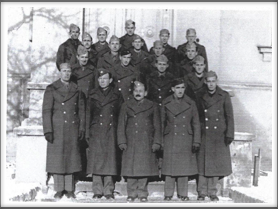 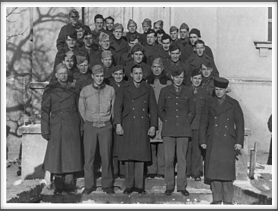 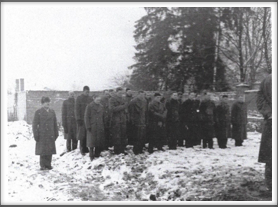 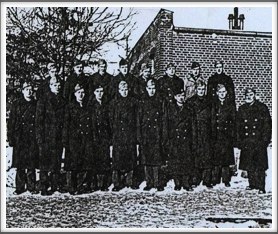 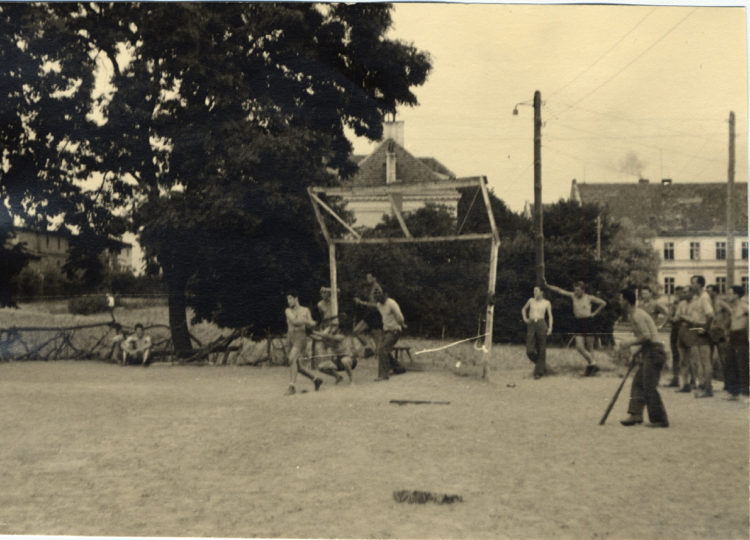 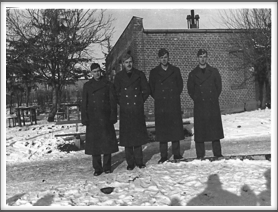 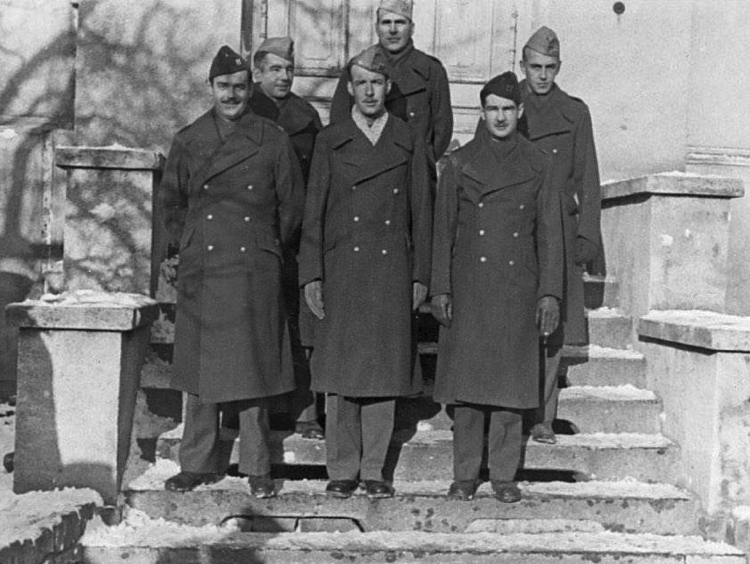 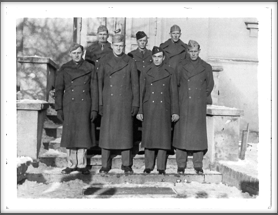 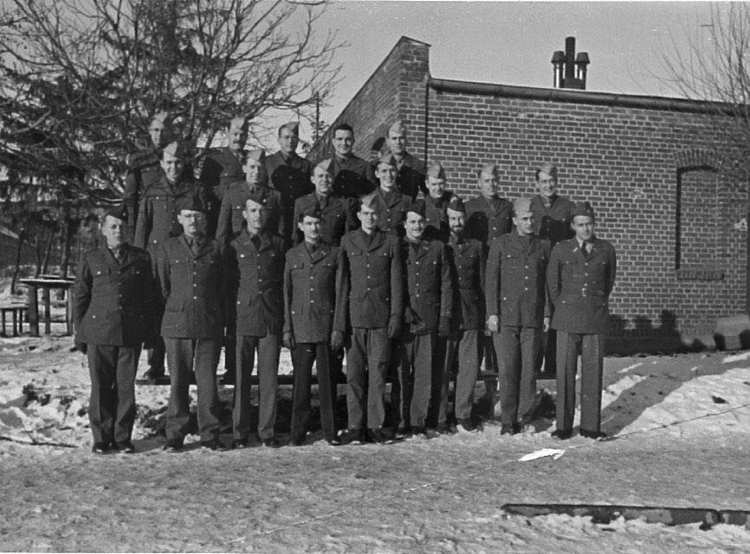 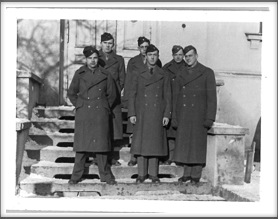 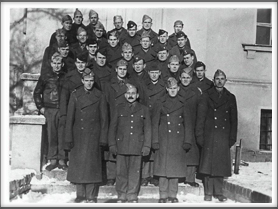 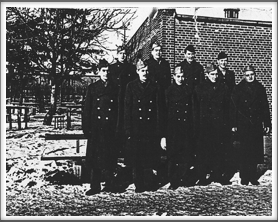 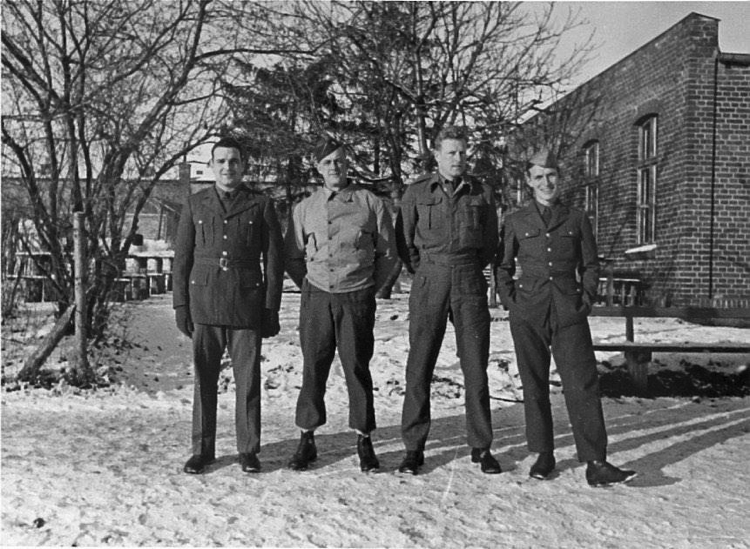 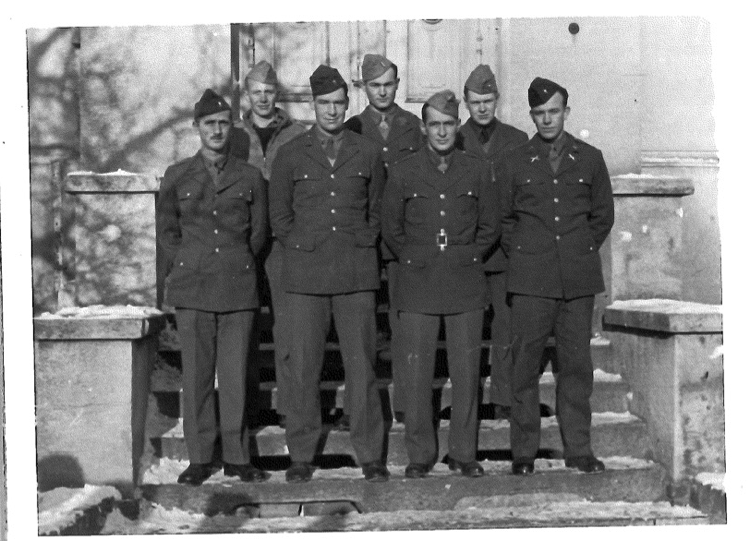 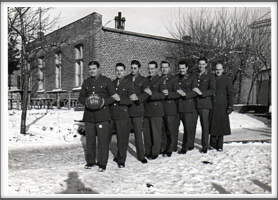 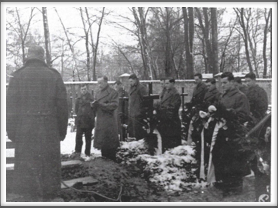 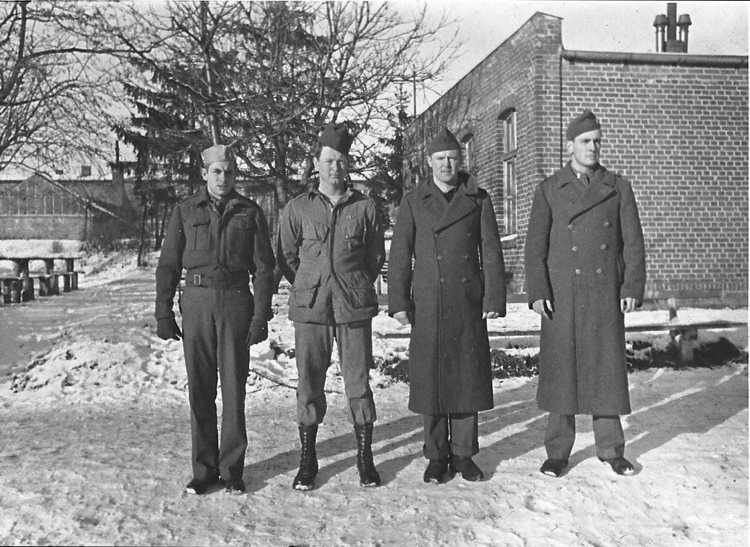 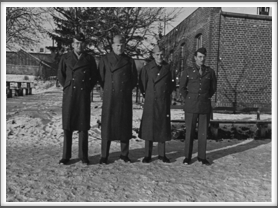 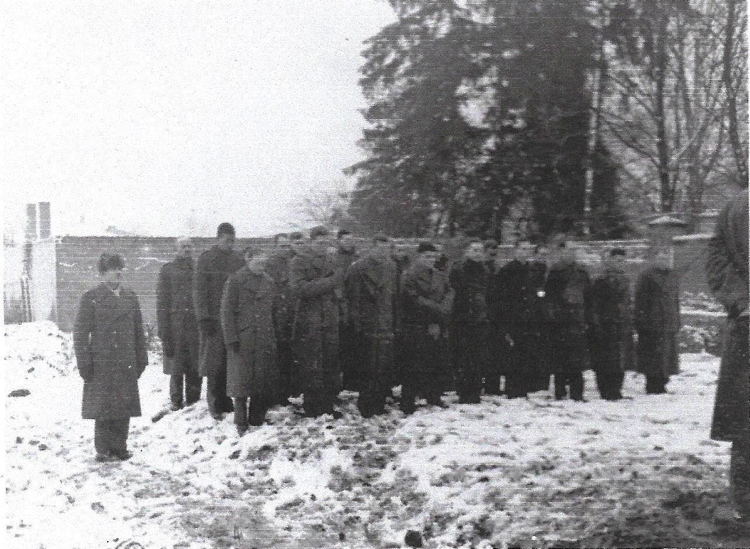 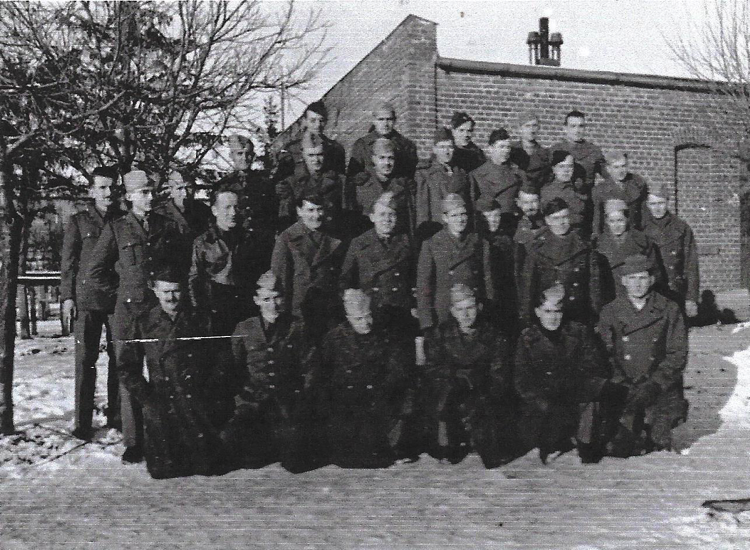 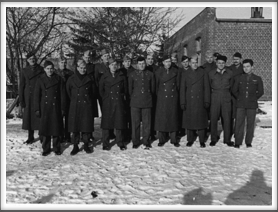 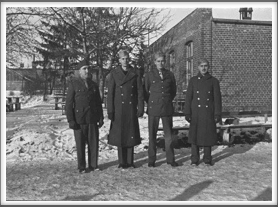 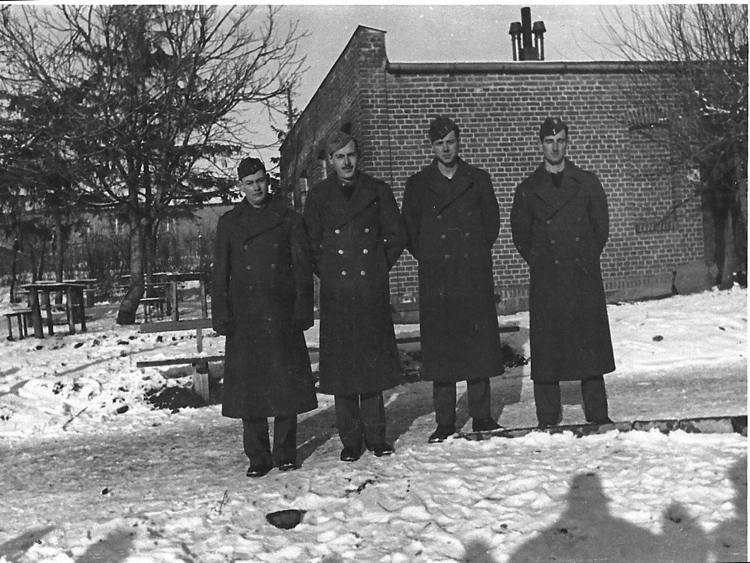 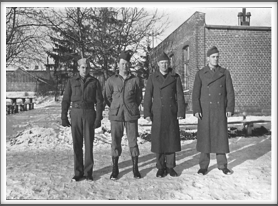 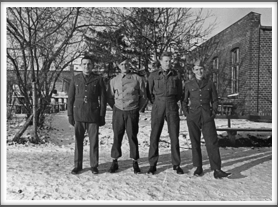 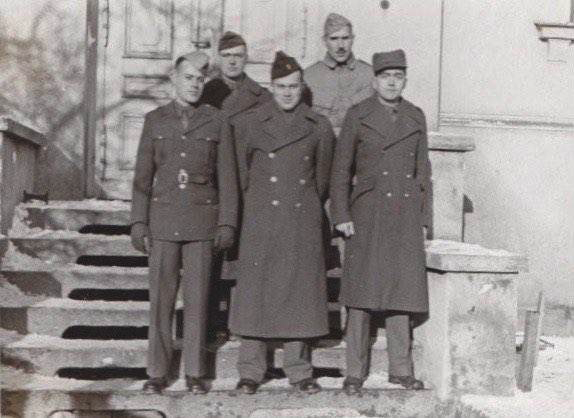 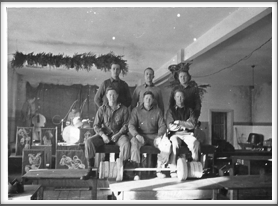 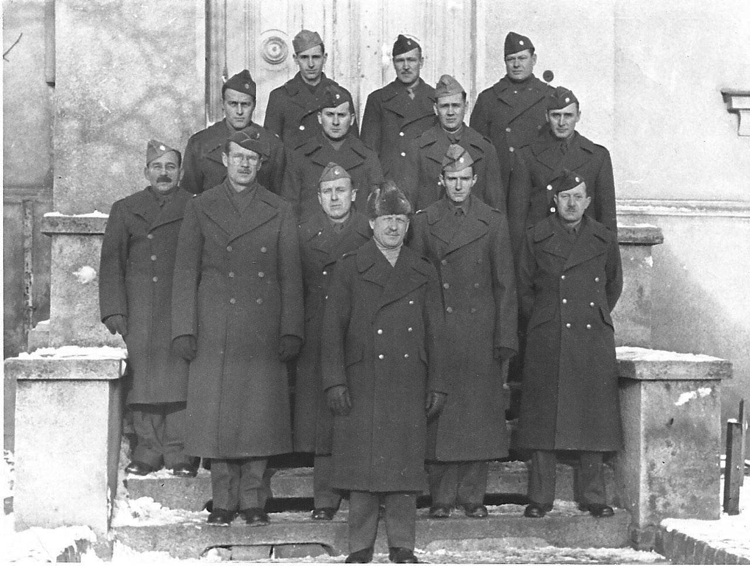 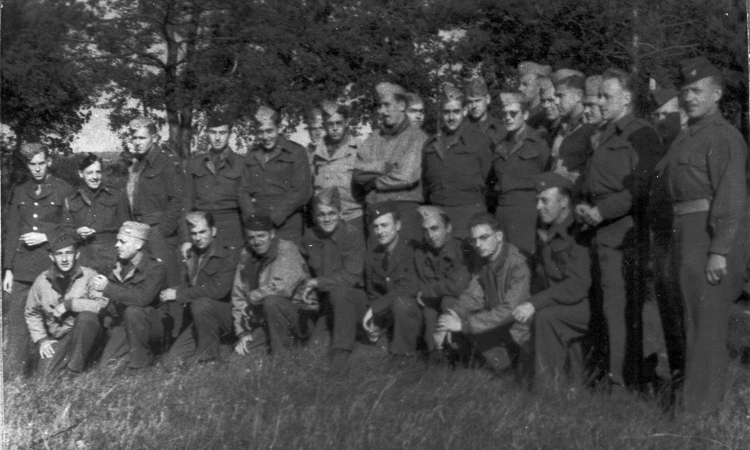 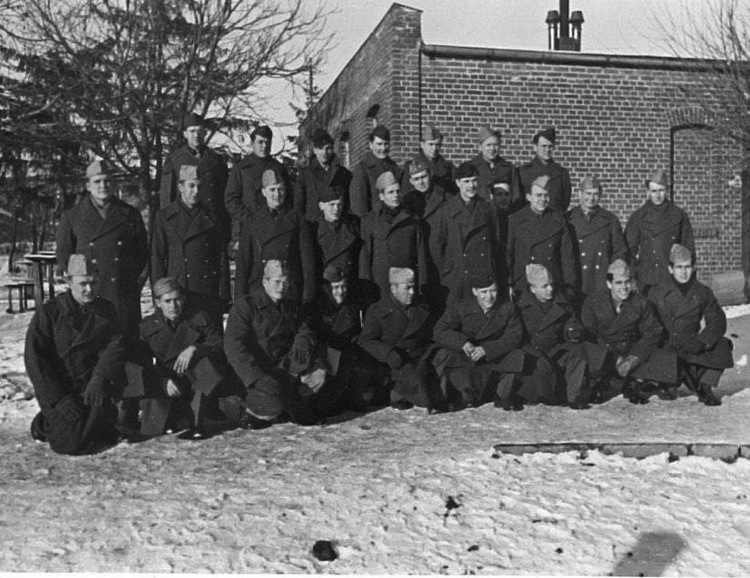 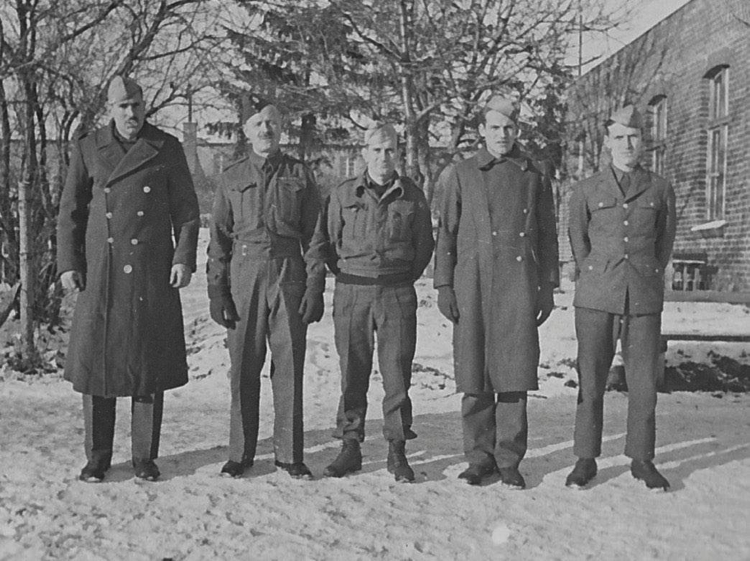 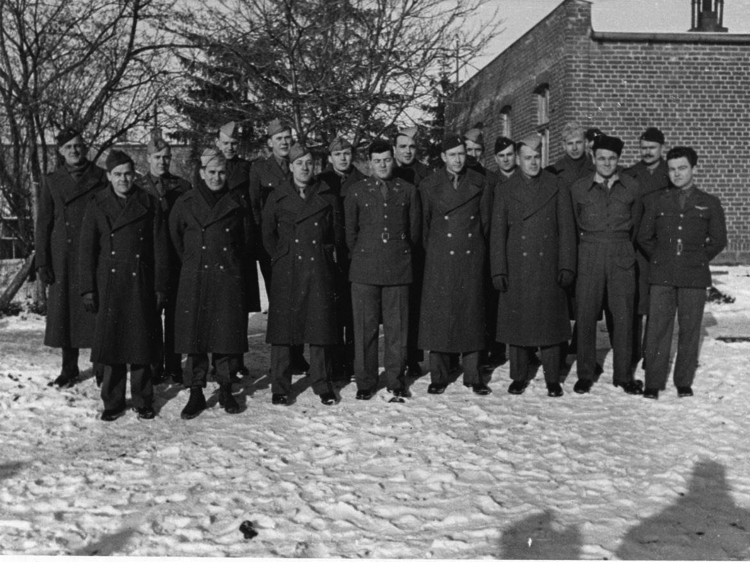 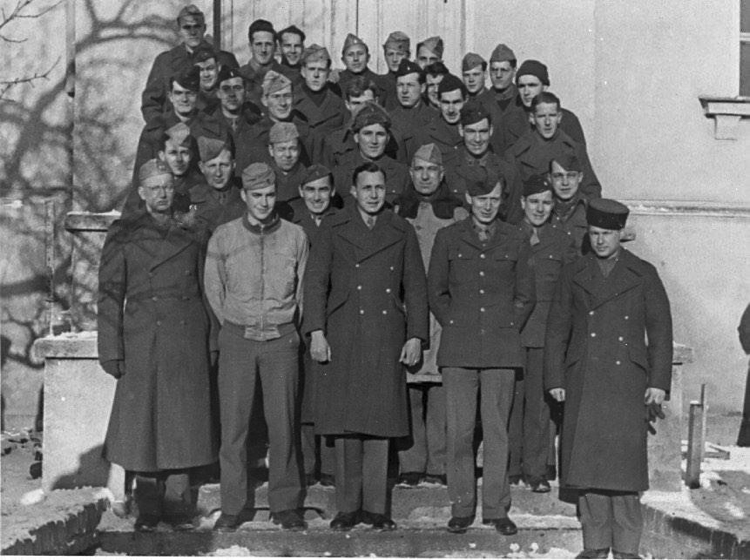 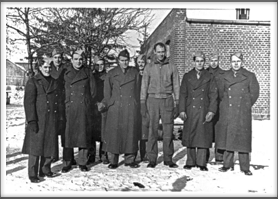 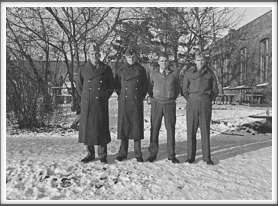 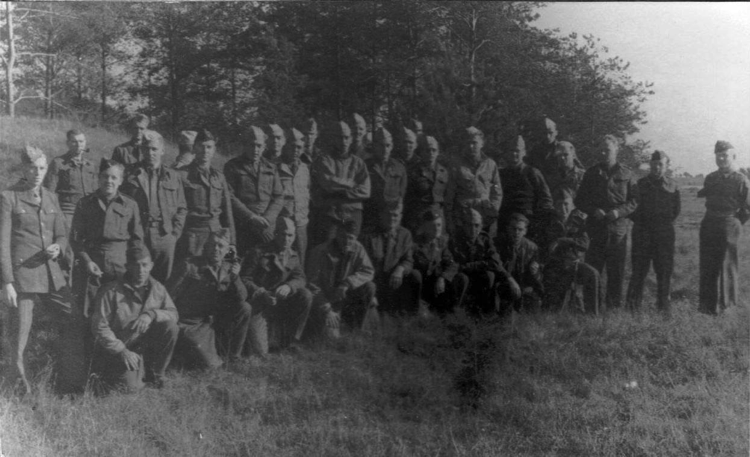 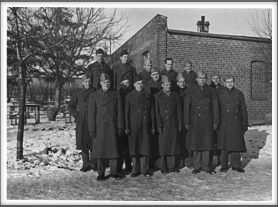 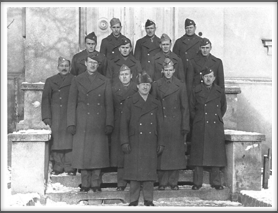 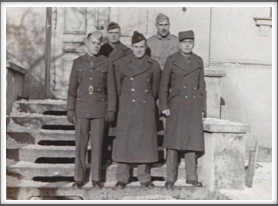 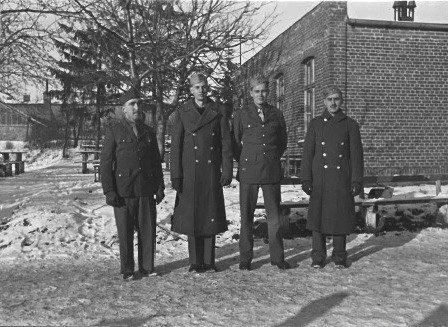 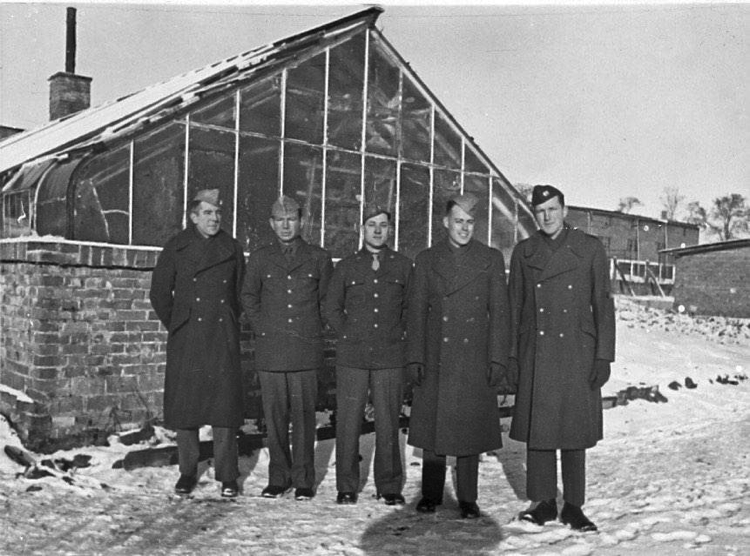 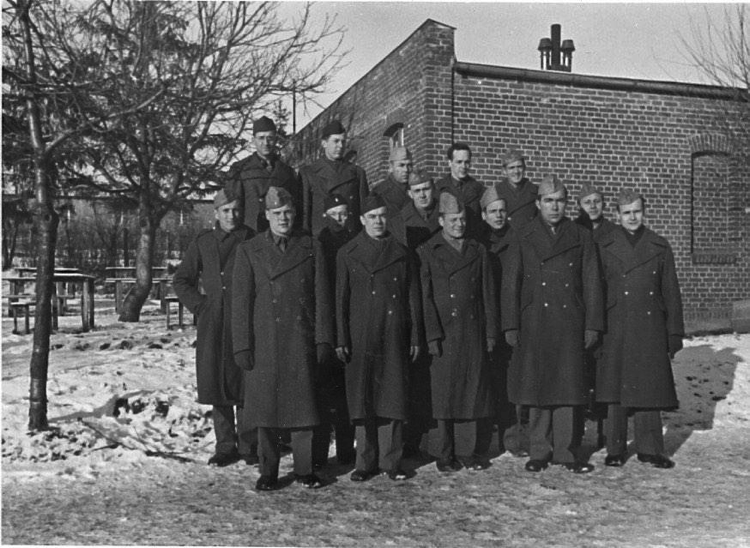 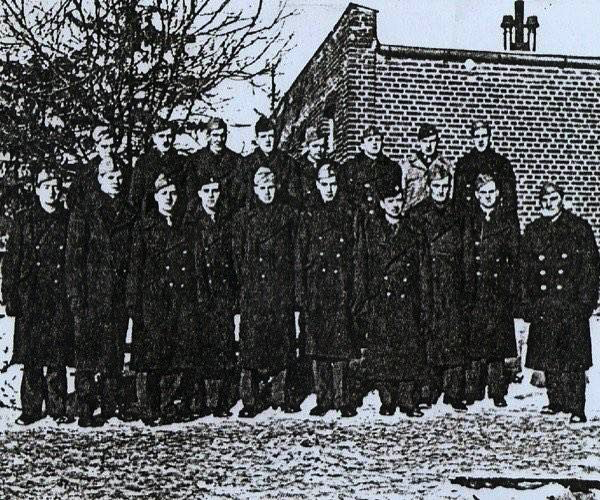 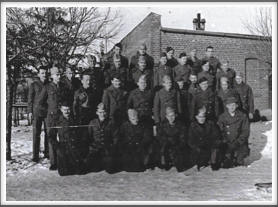 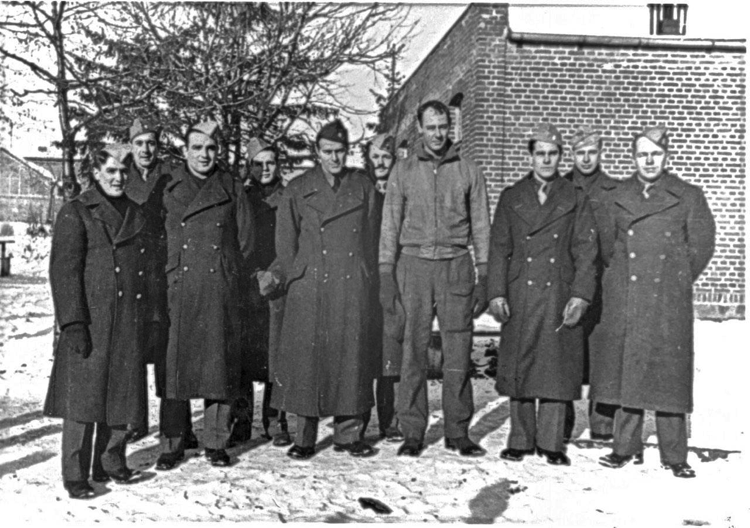 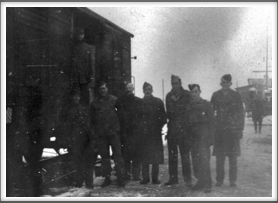 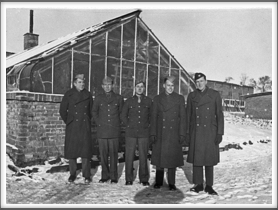 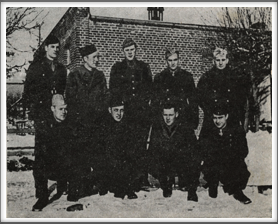 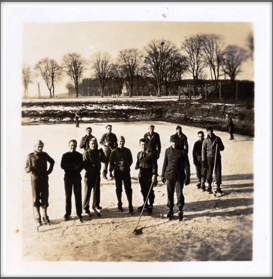 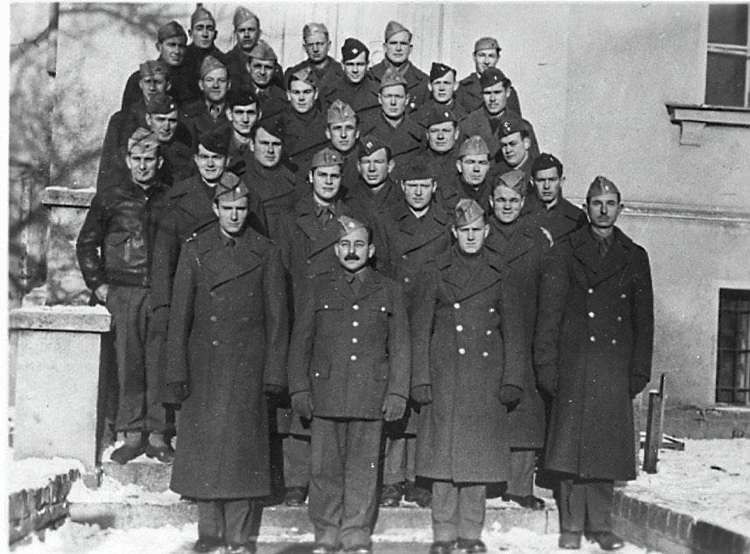 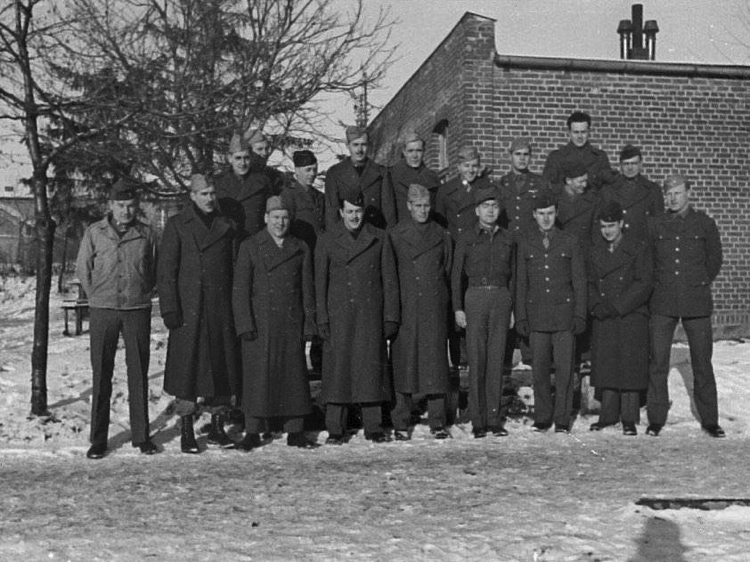 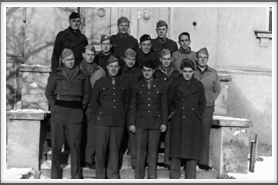 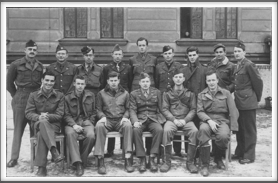 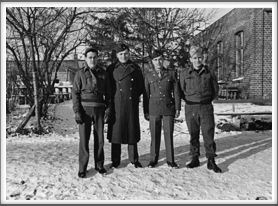 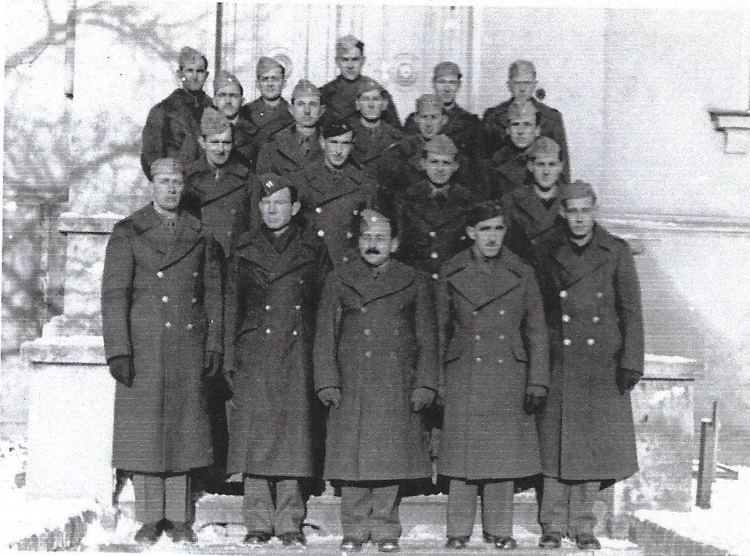 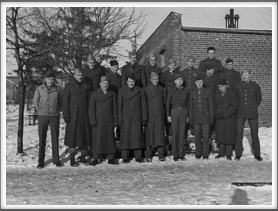 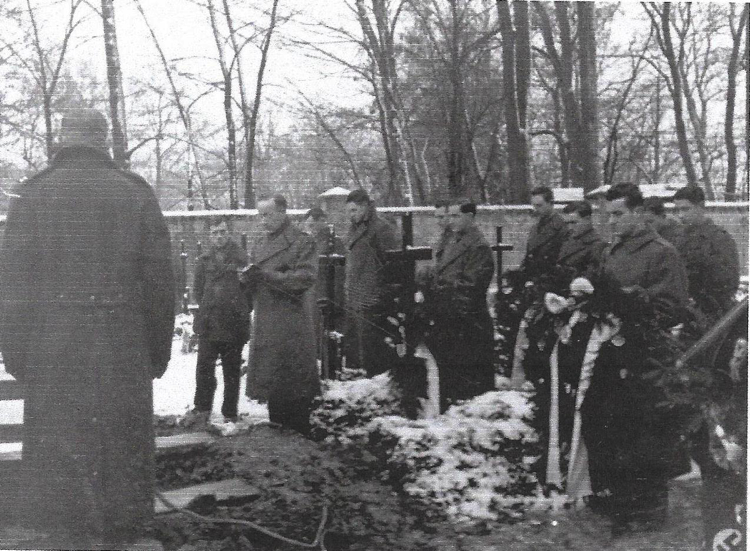 Most of these group photos were taken at Oflag 64 in mid-January 1944 and were obtained from many of our Kriegies or their family members. 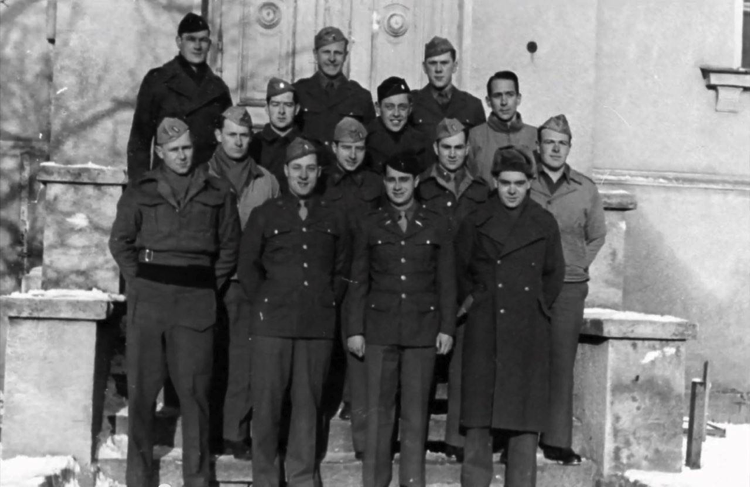 The American and International Red Cross provided the uniforms and also took most of the in-camp photos. 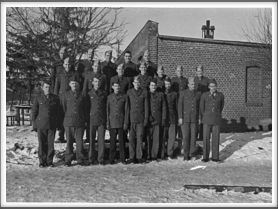 Groupings varied, some by state, some by unit, some by rank, and some by mess. 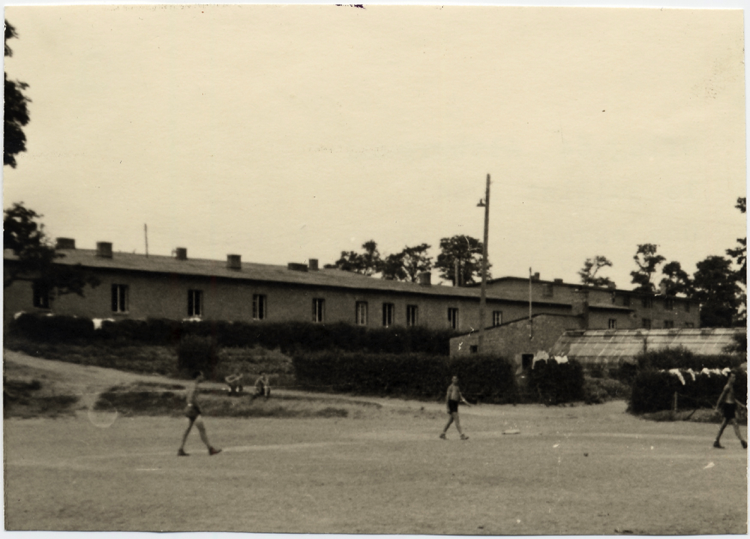 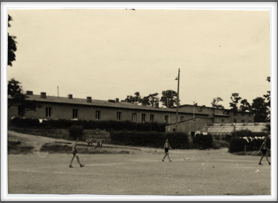 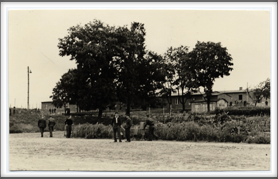 Many of the photos are stamped on the back “Lichtbild geprüft Oflag 64” which we are told means “Photograph inspected, Oflag 64”. 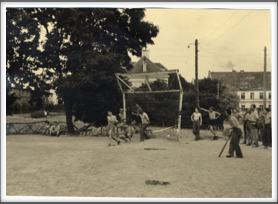 A number of photos towards the end of this section were provided by the International Committee of the Red Cross and are used with their permission. 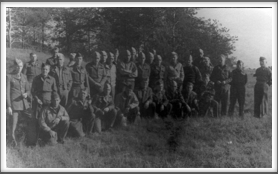 NOTE: If you can fill in missing names on any photos, please click here to email us. 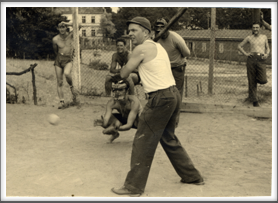 Please help us identify unidentified men. 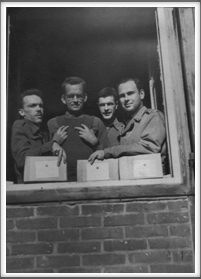 Please help us identify these men. 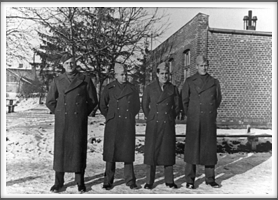 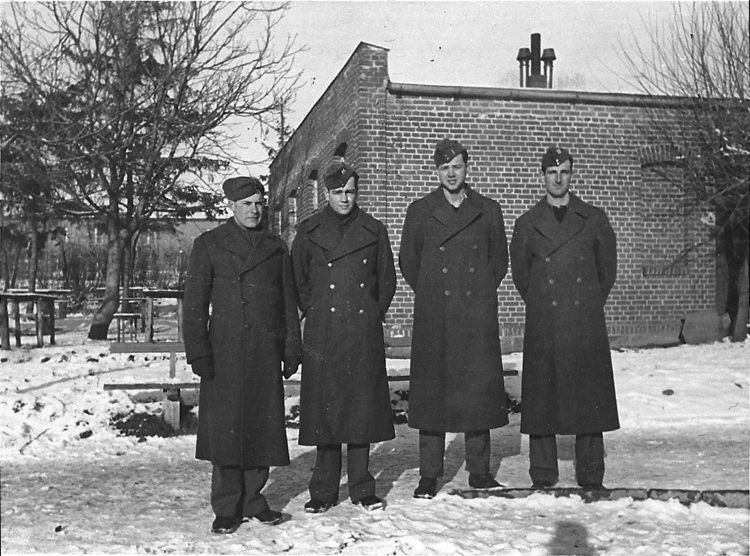 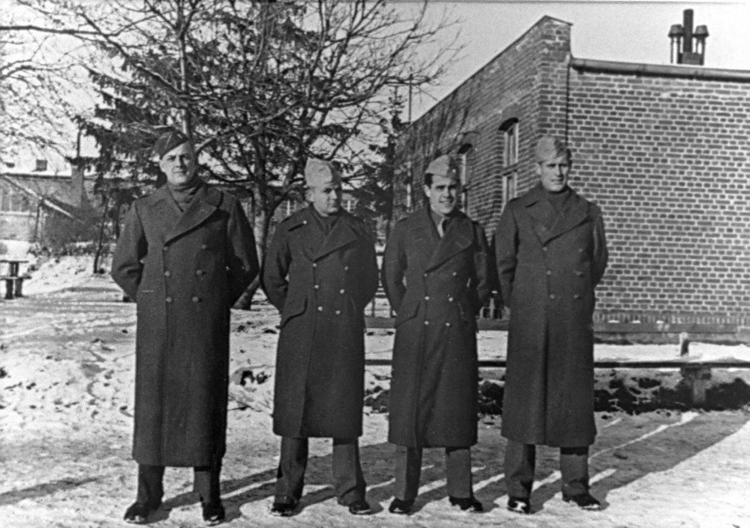 Back l-r: Edwin O. 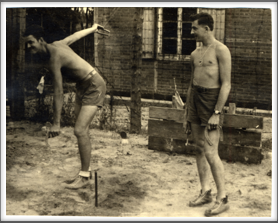 Ward, ?? 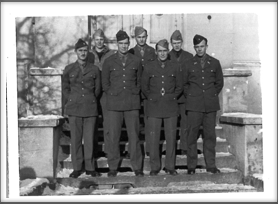 ?, Bill Farrell, Bob Wick, Sammy Saxton, Charlie Cheatham, Robert Lobb, ??? 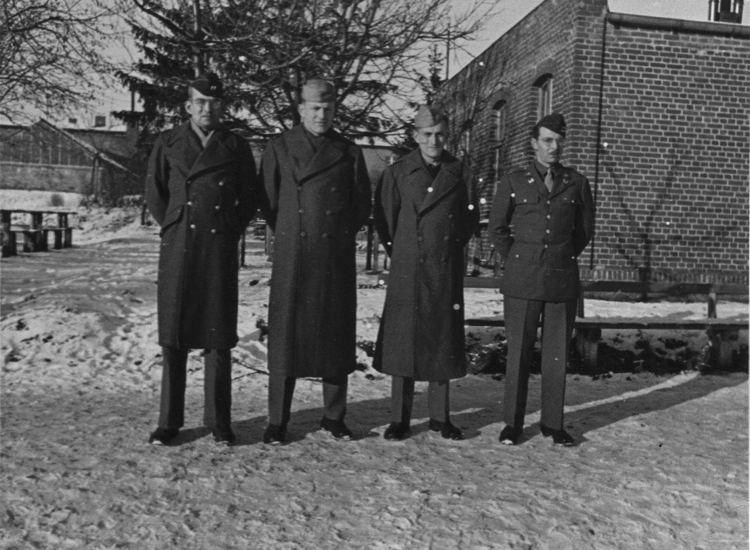 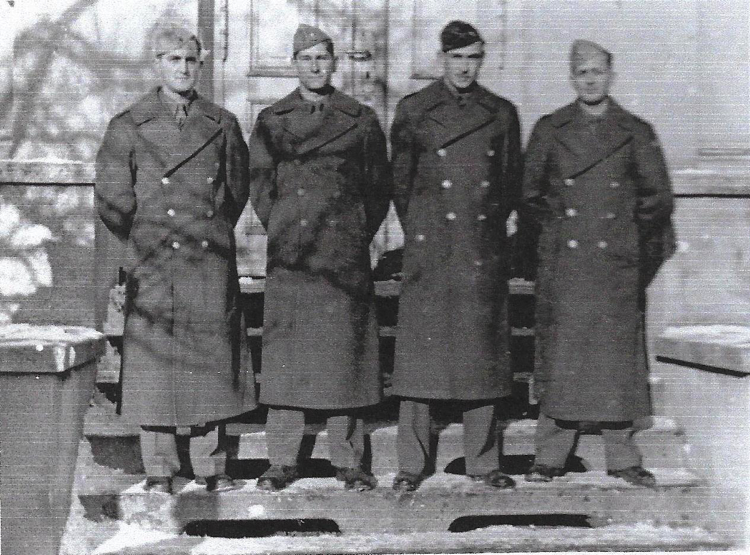 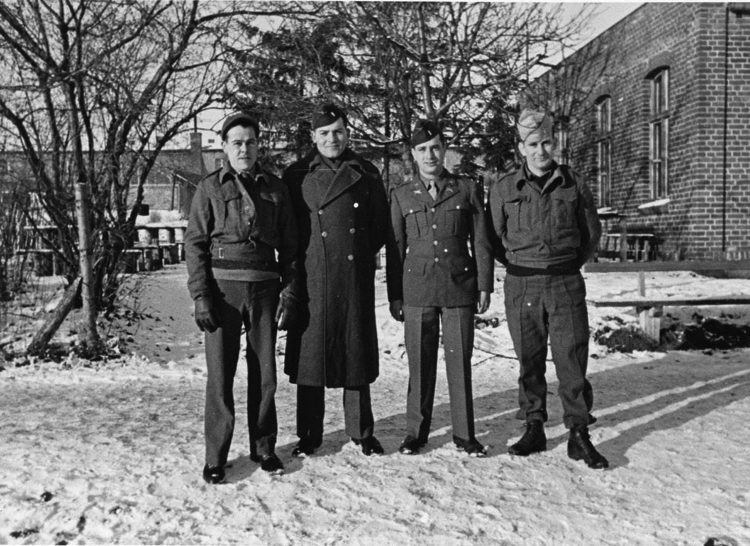 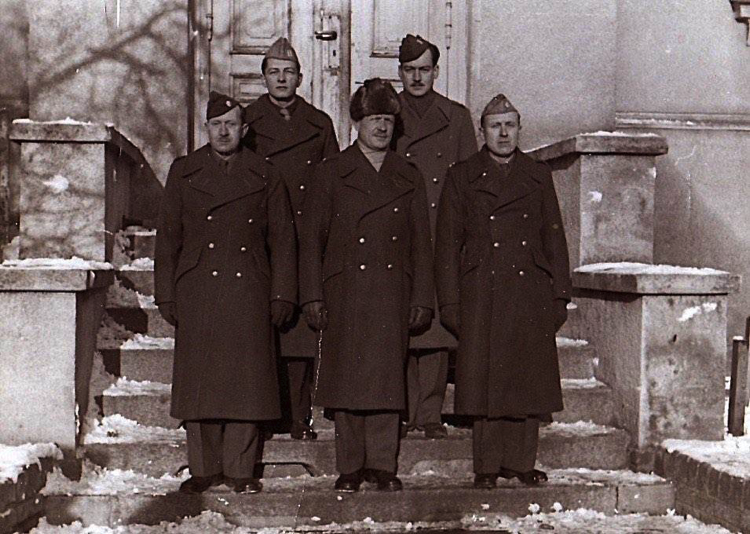 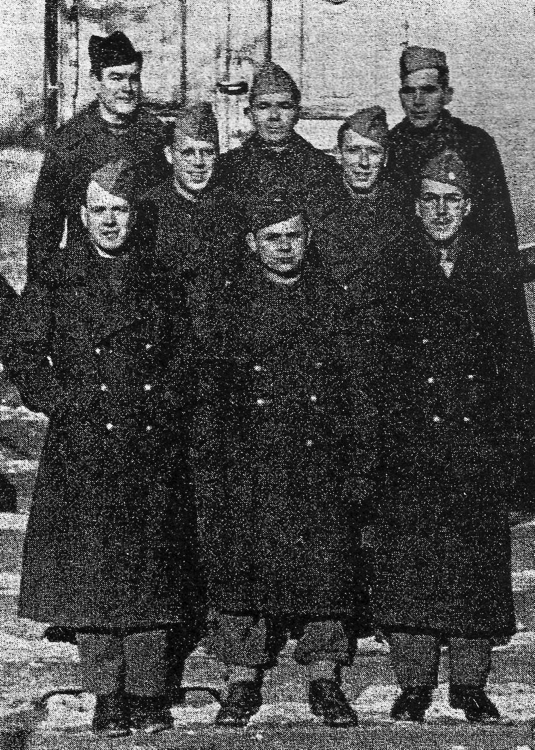 Front: 2nd from left: Lou Otterbein; 5th, Hill “Spud” Murphy. Others ??? 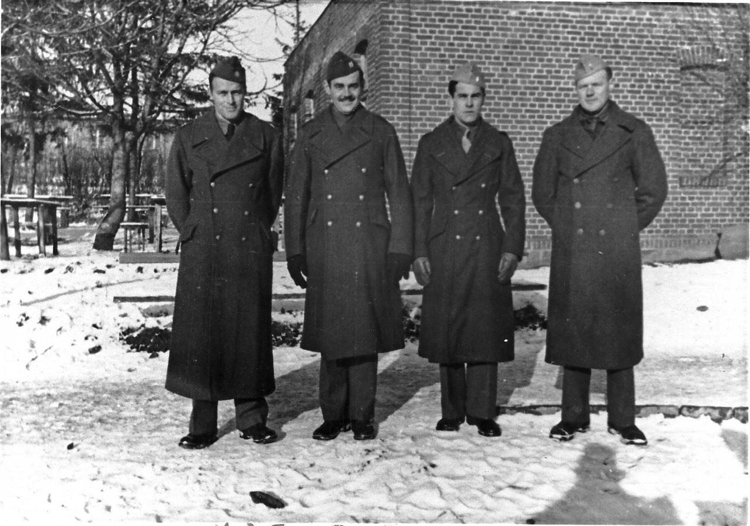 Front l-r: ?? 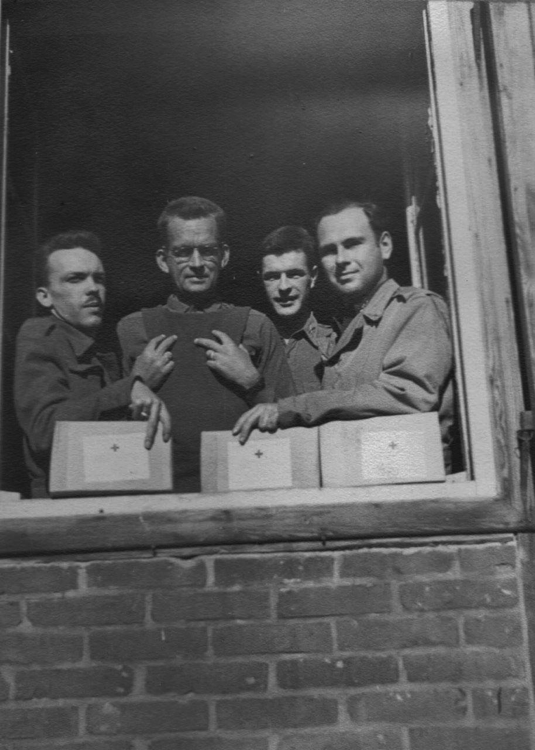 ?, Leo Farber, John Waters, John Shirk, Bill Cory, “Doc” Spurgin; Back l-r: ?? 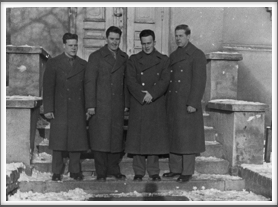 ?, Wilbur Sharpe, Marcellus Hughes, ??? 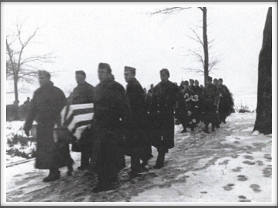 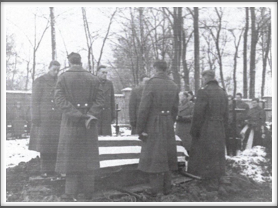 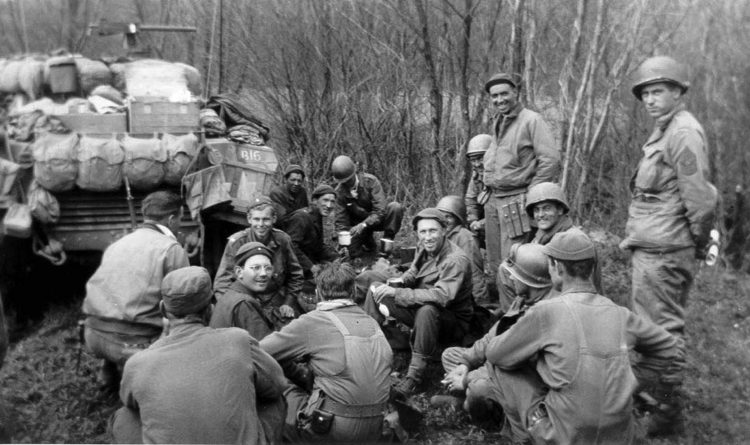 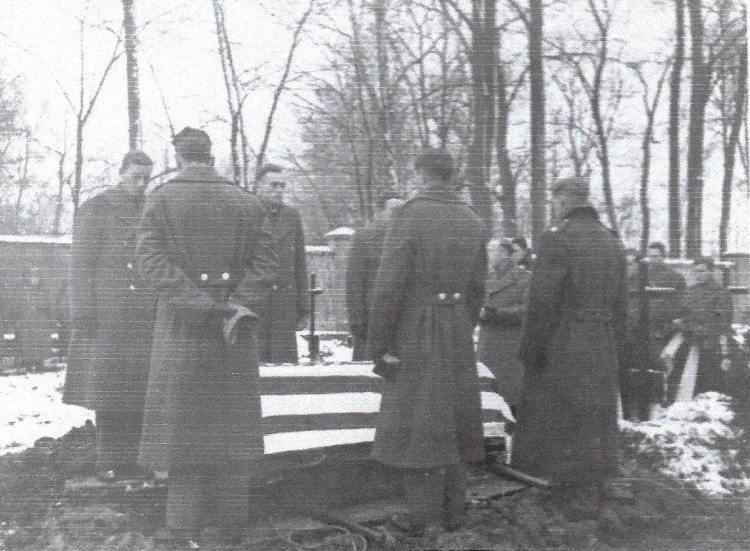 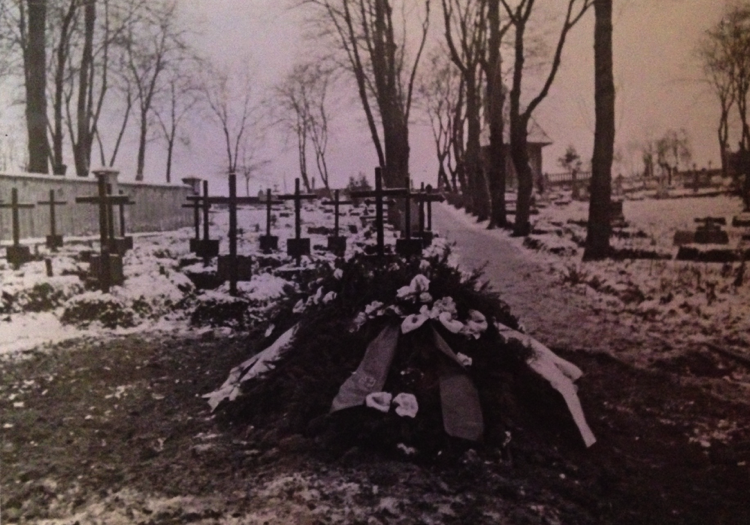 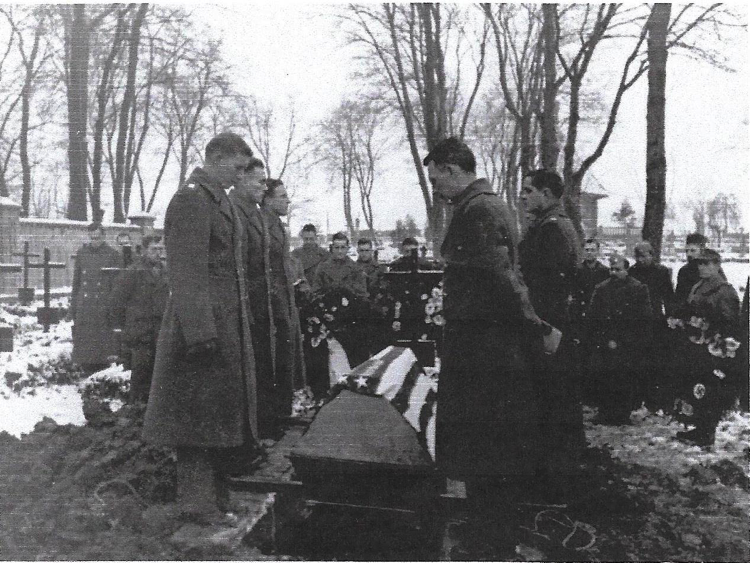 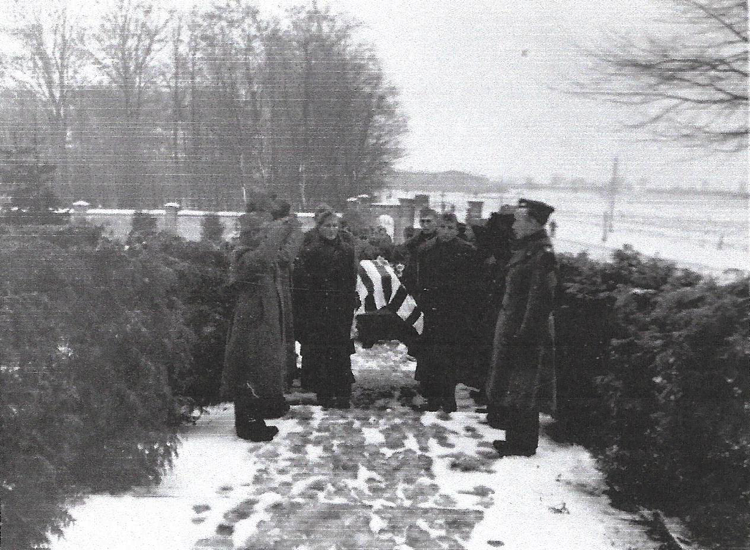 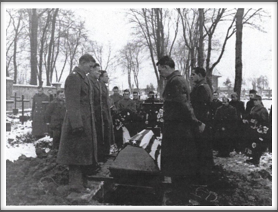 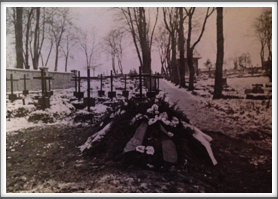 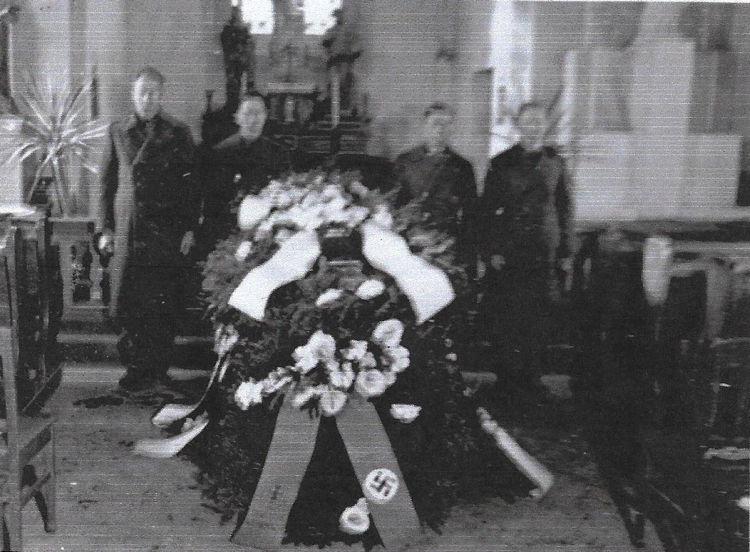 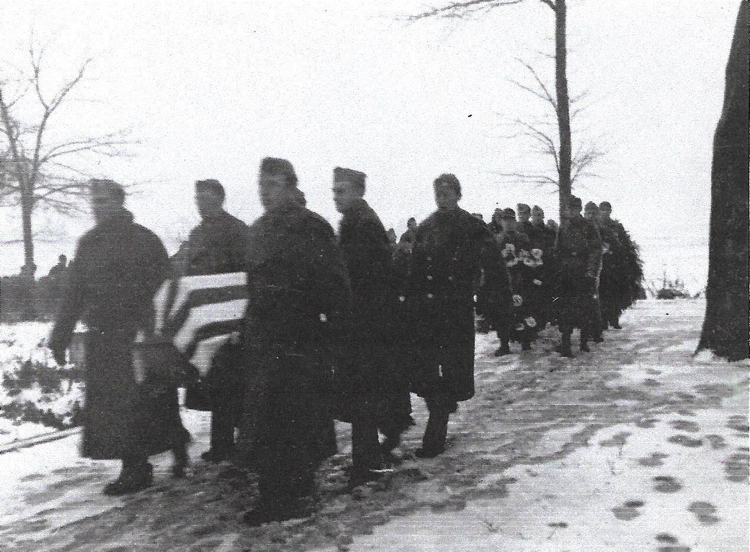 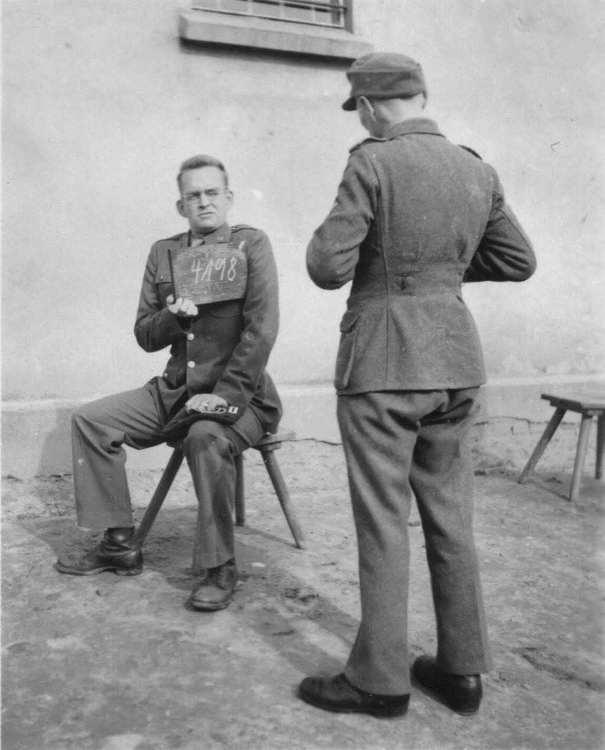 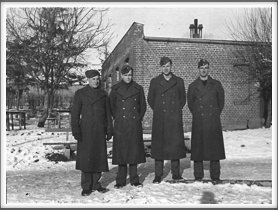 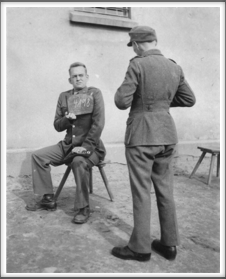 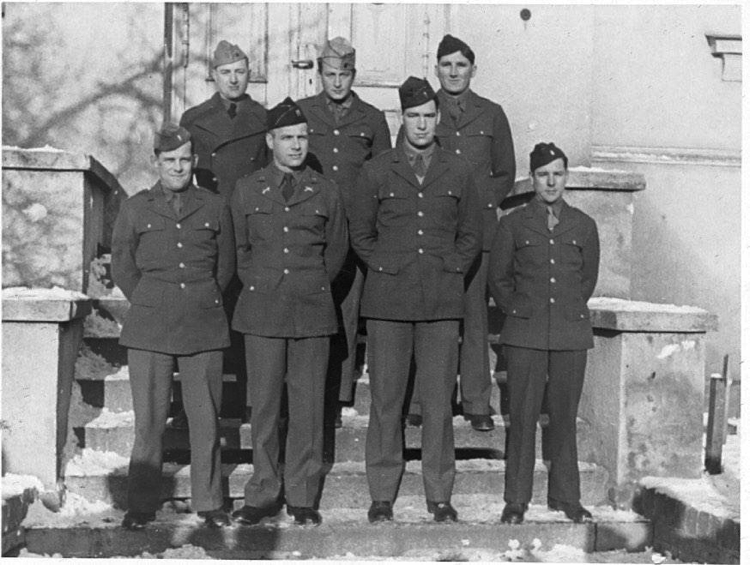 This photo was taken in February 1944. 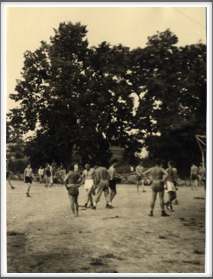 (If you have an original, please contact us.) 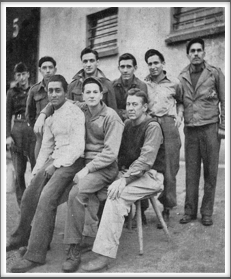 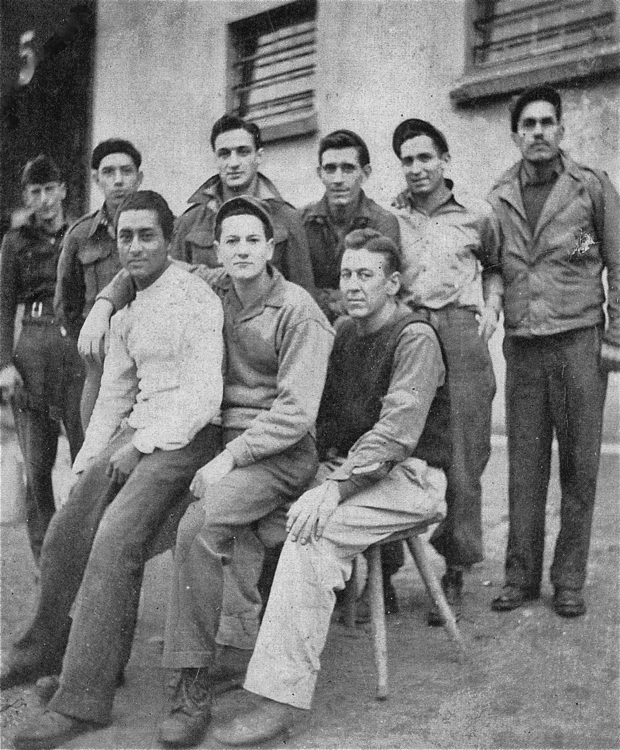 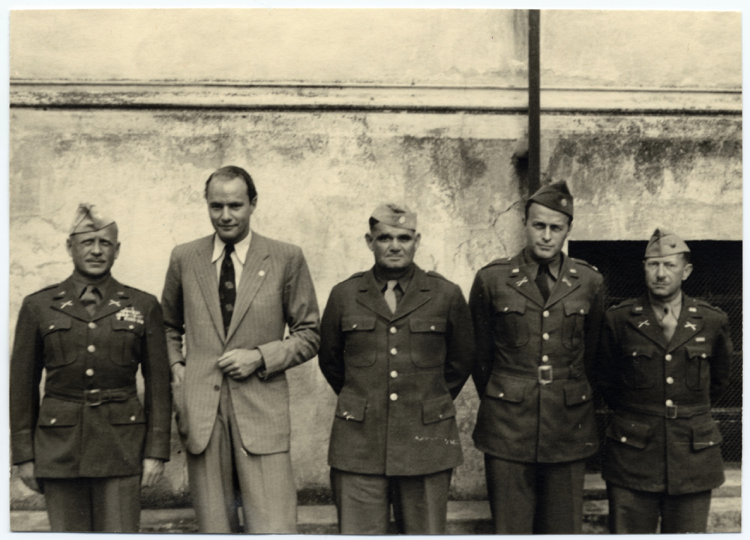 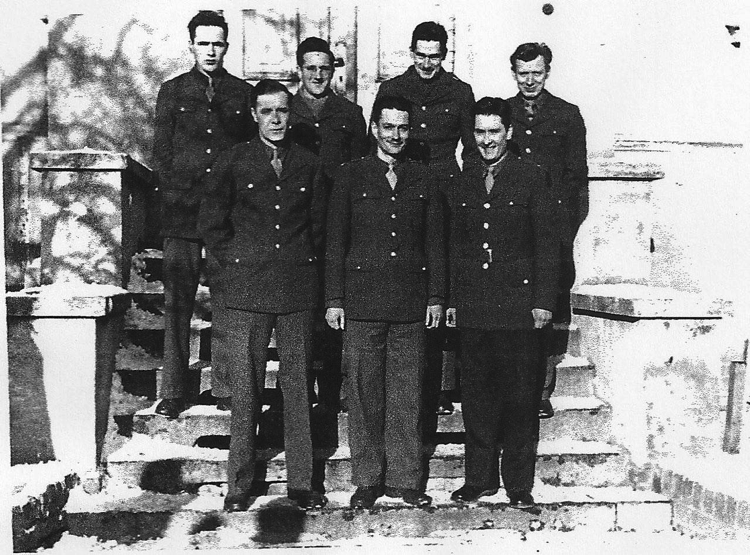 Front l-r: Harold Tallman, Carl Burrows, Henry (Gaither) Perry, Sid Waldman; Back l-r: William Guest, Stephen Kane, Robert Aschim, Anthony Cipriani, Frank Aten. 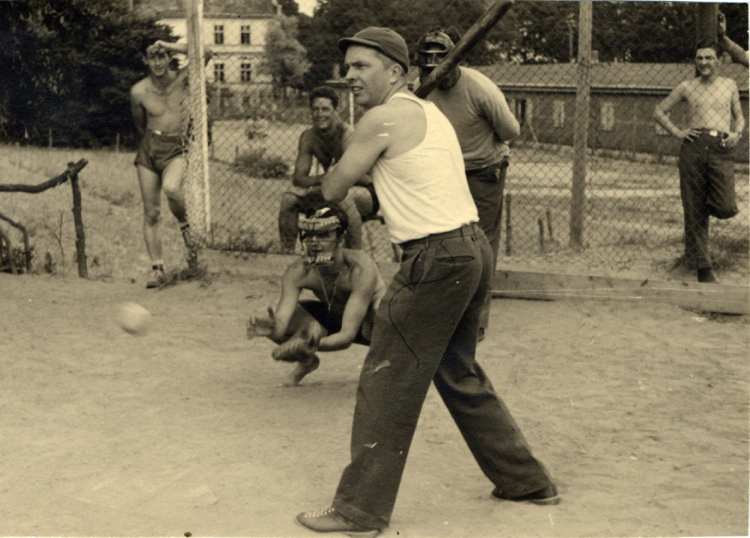 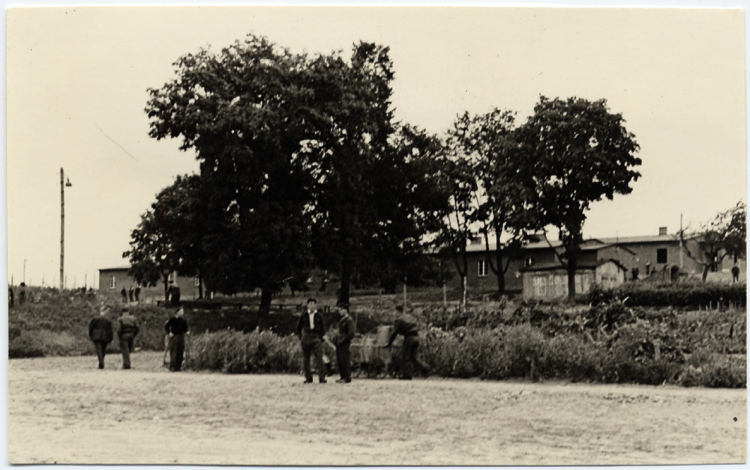 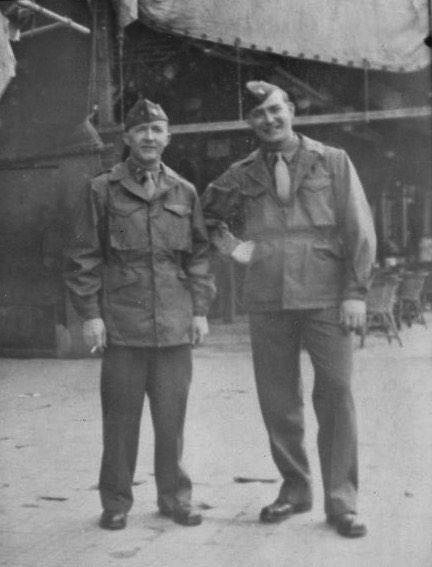 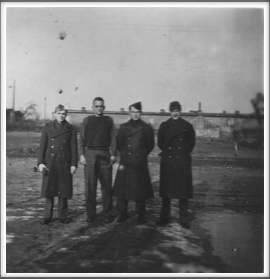 Photo taken 1/1944. 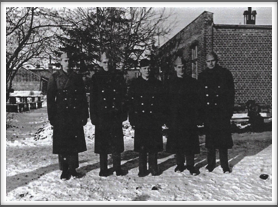 Please help us identify these men. 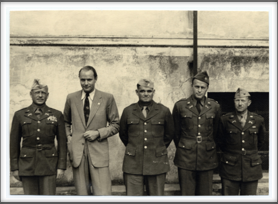 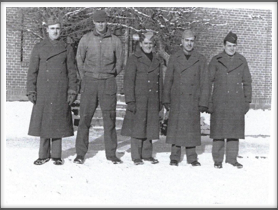 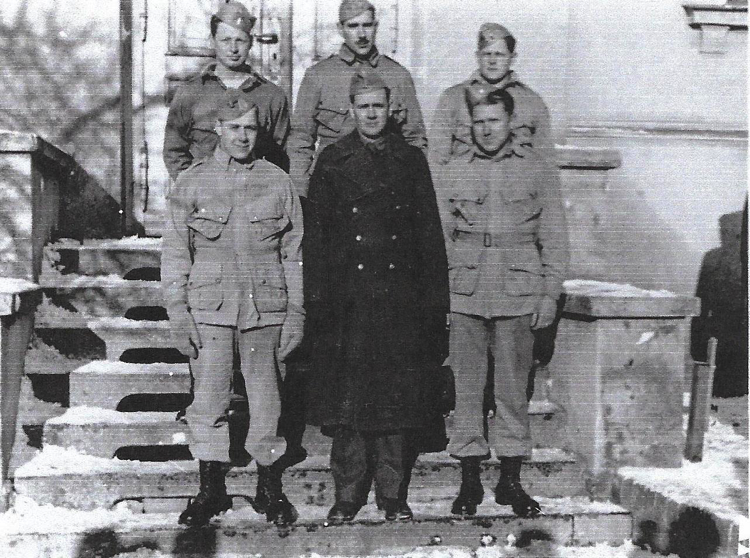 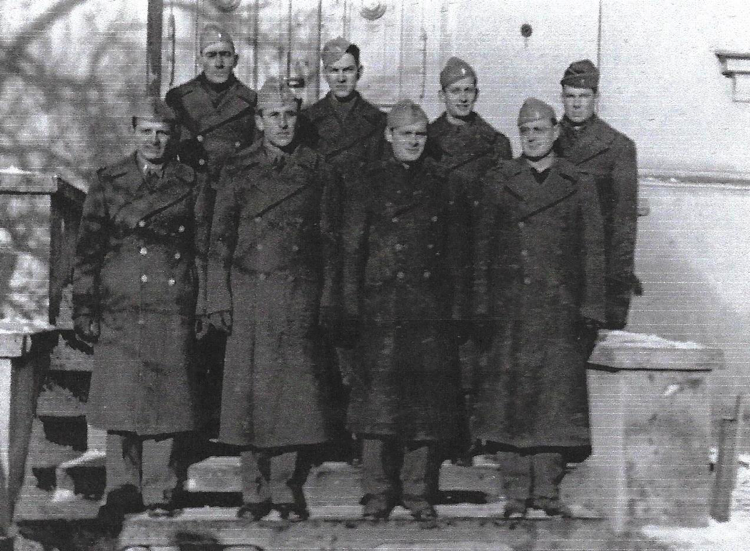 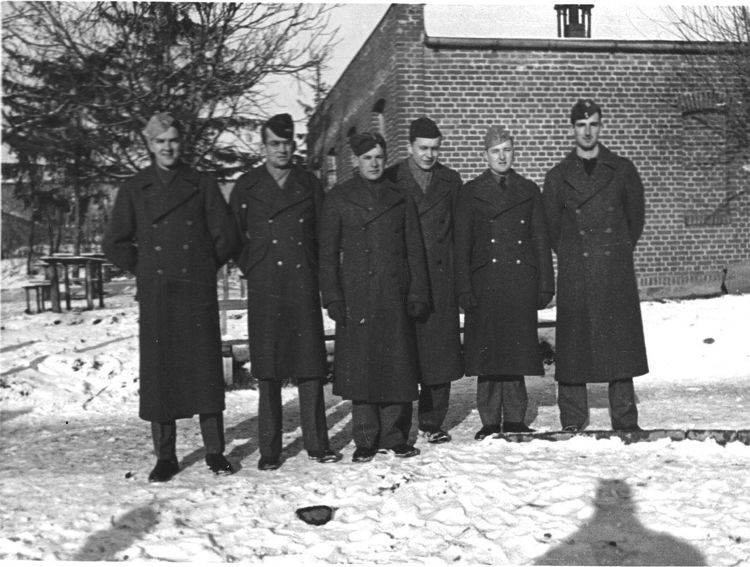 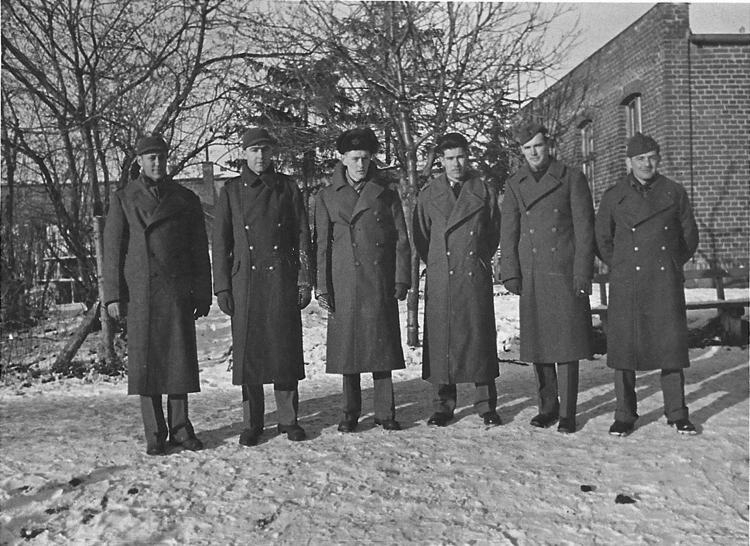 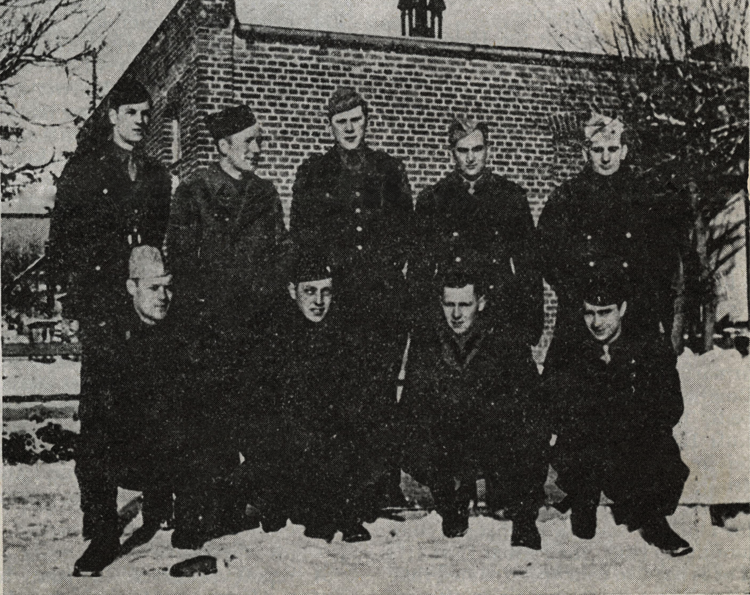 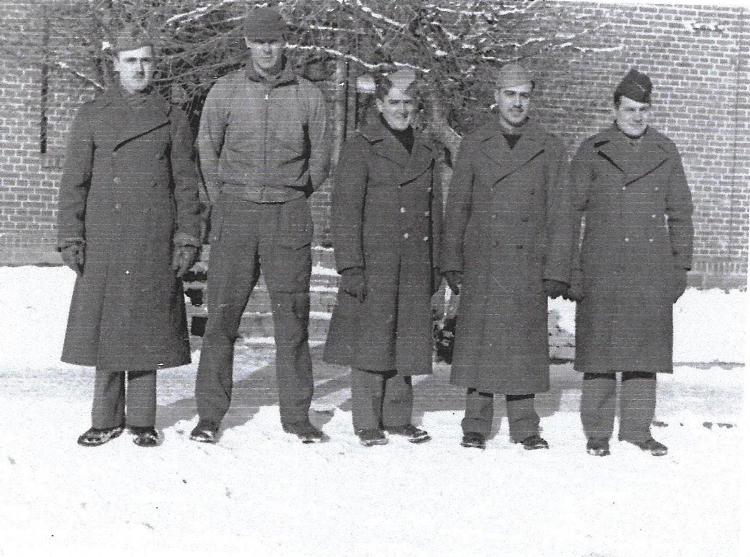 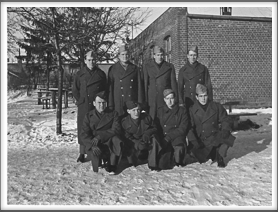 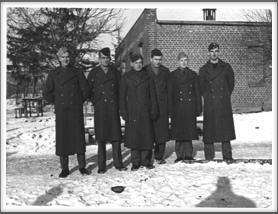 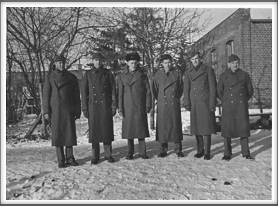 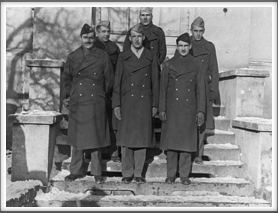 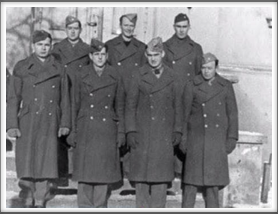 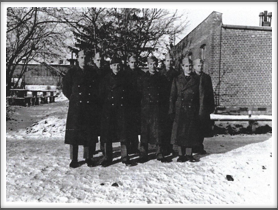 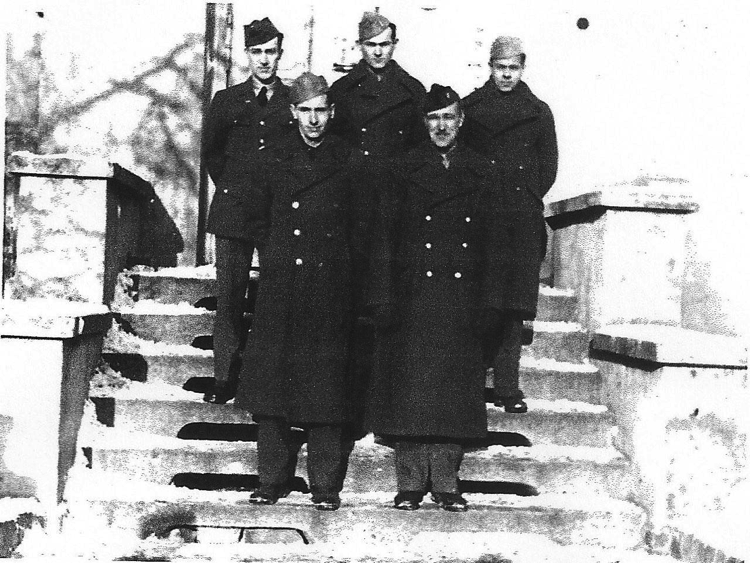 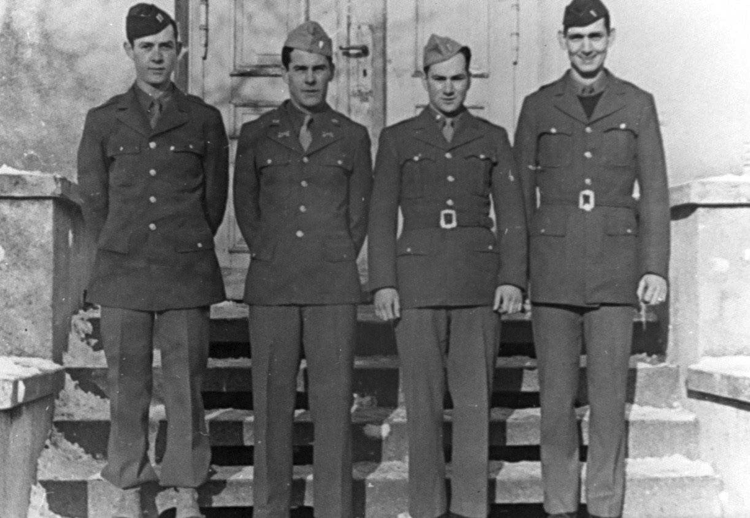 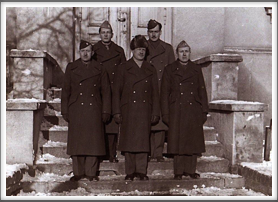 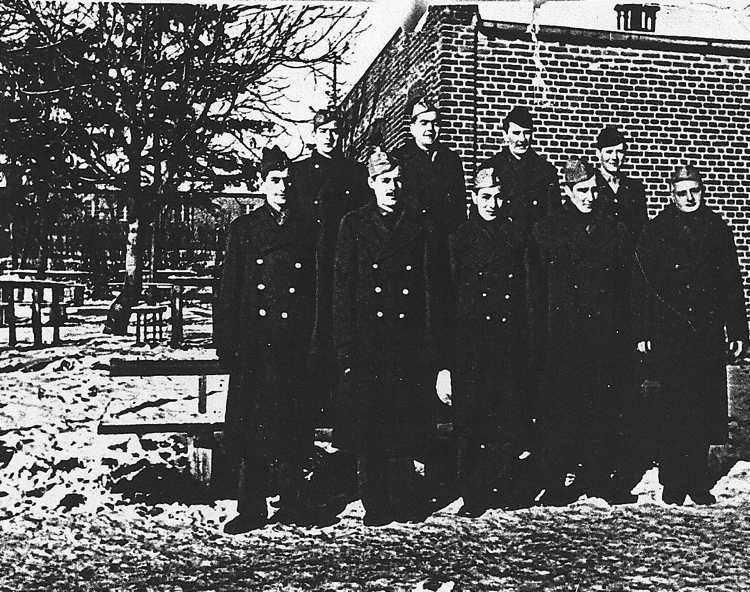 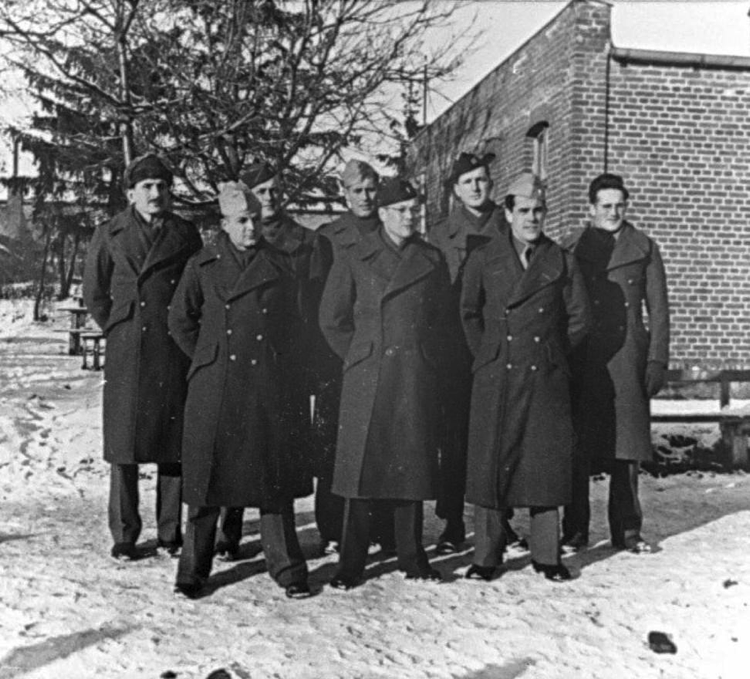 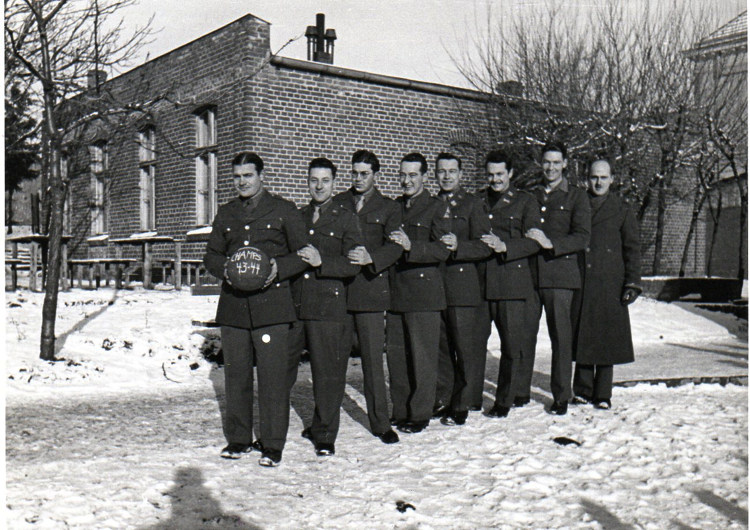 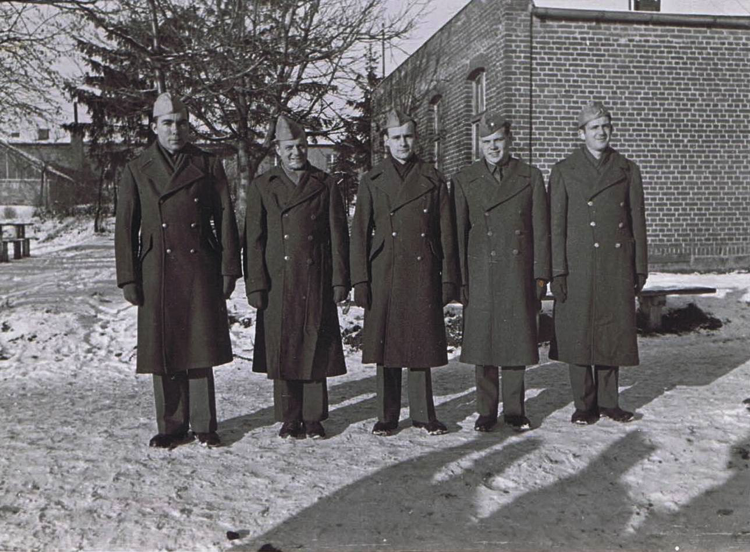 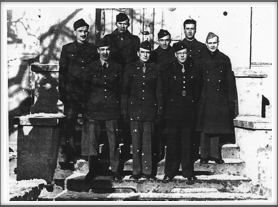 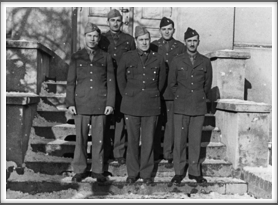 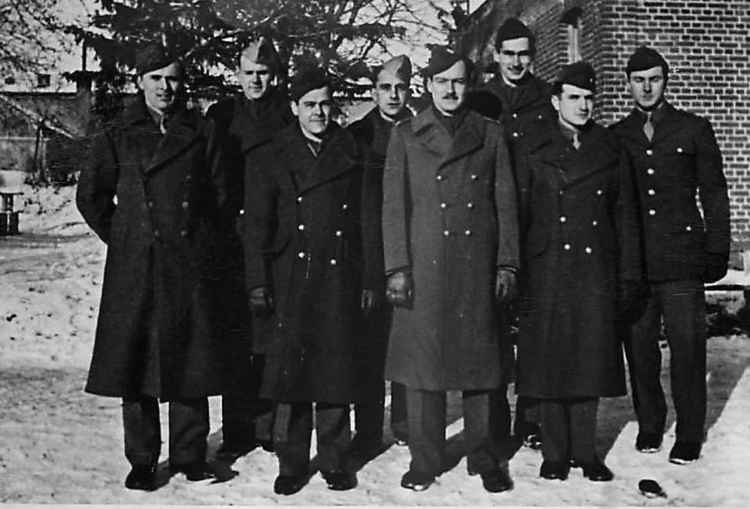 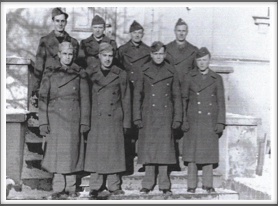 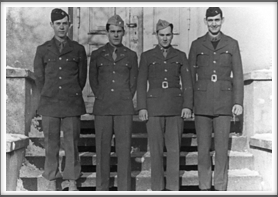 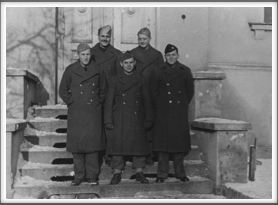 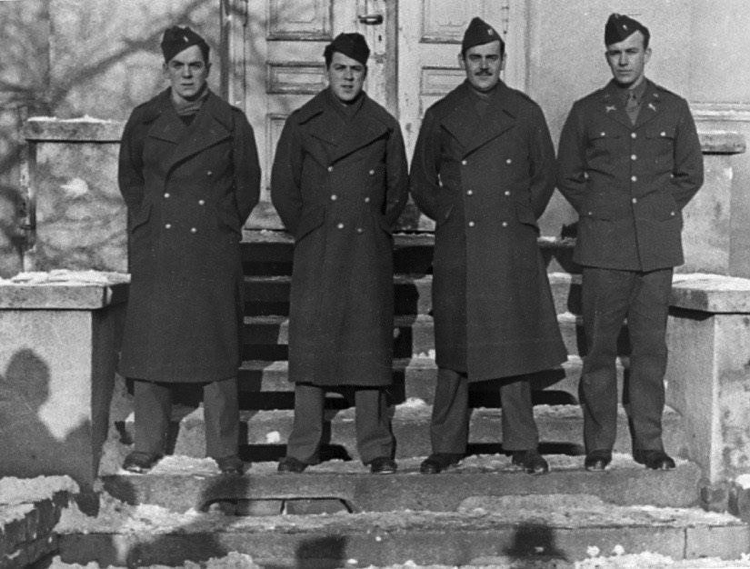 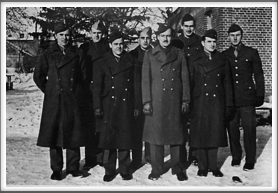 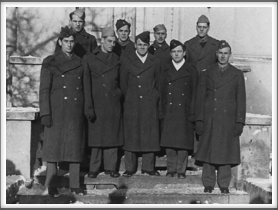 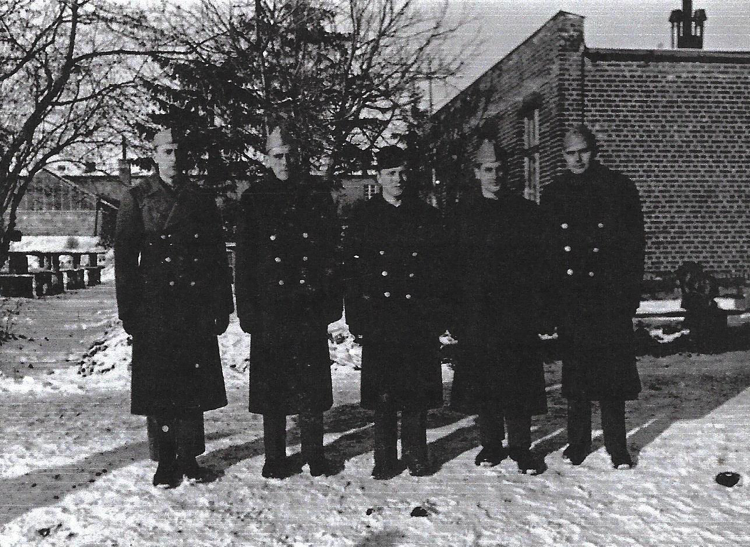 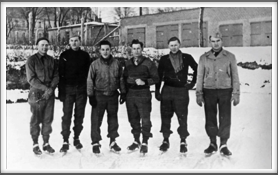 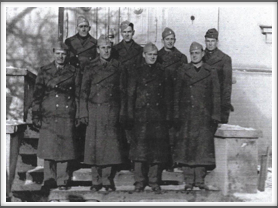 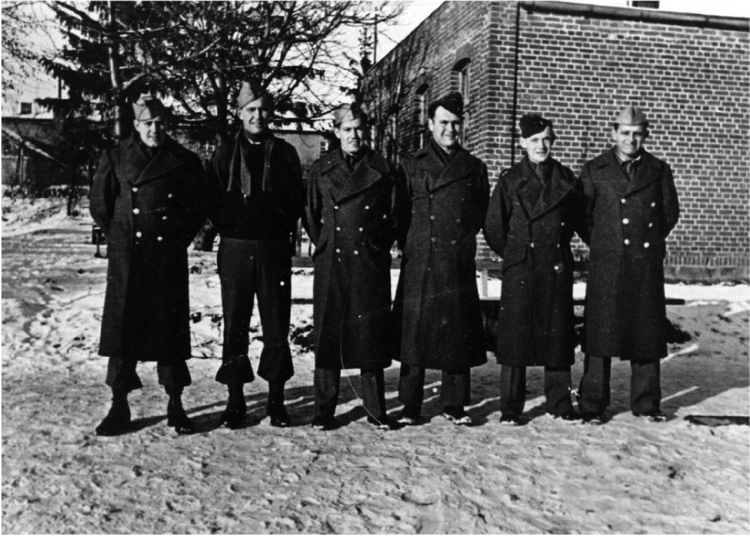 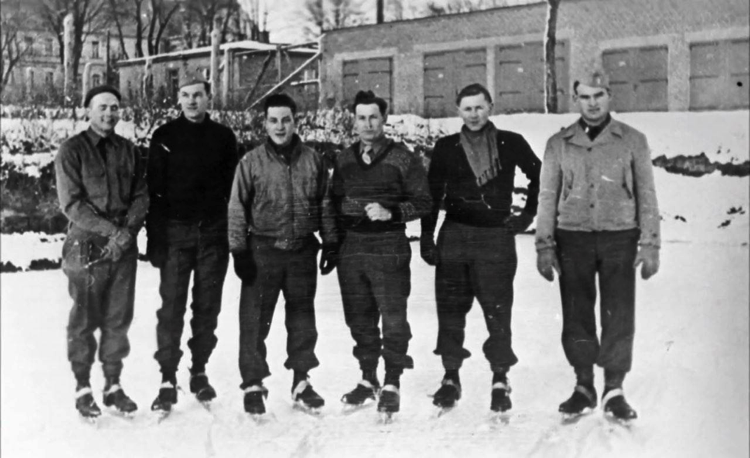 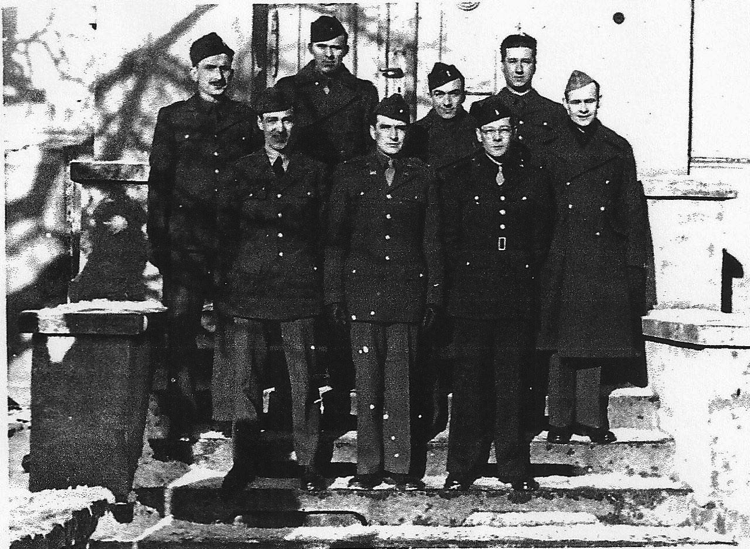 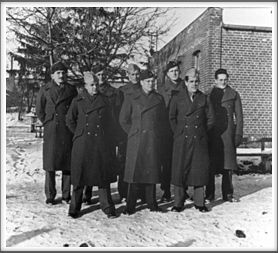 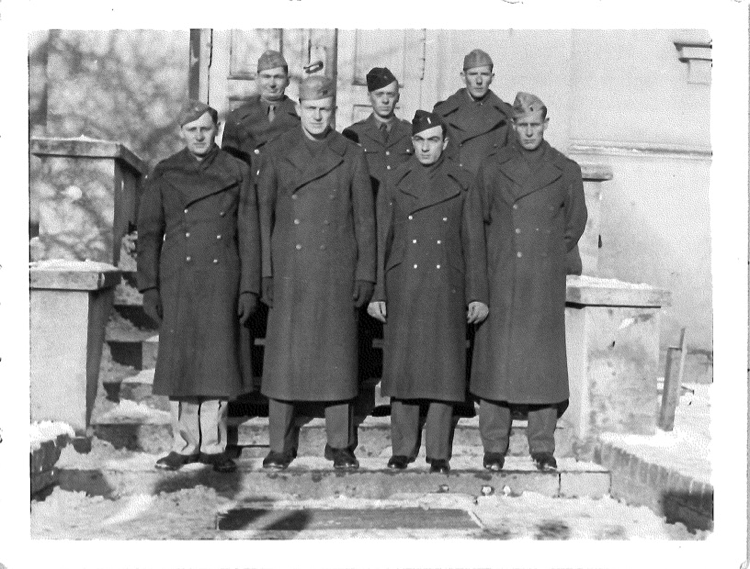 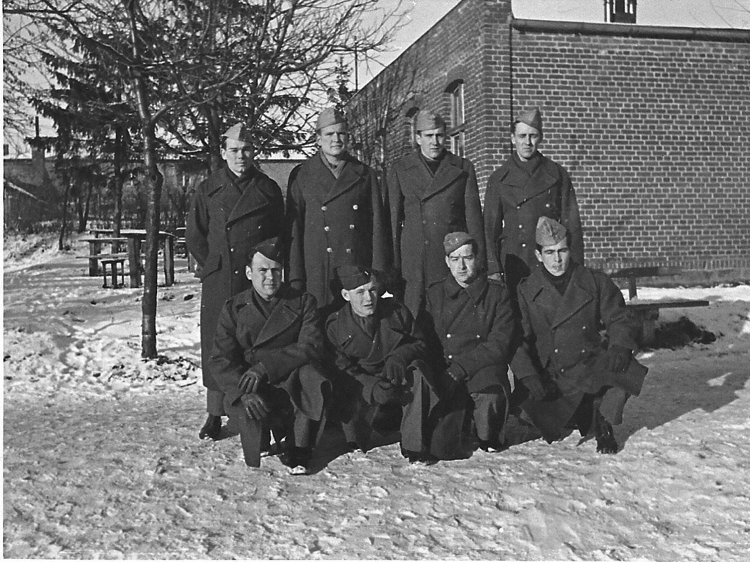 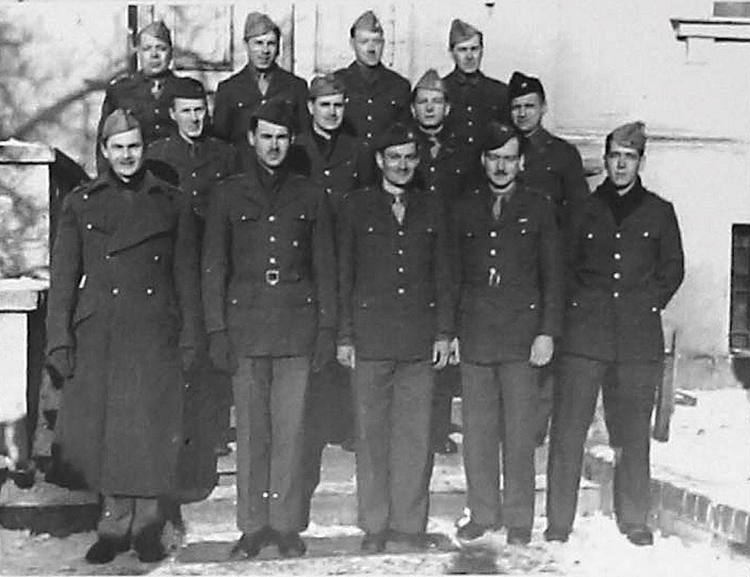 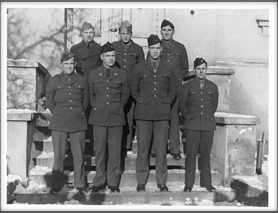 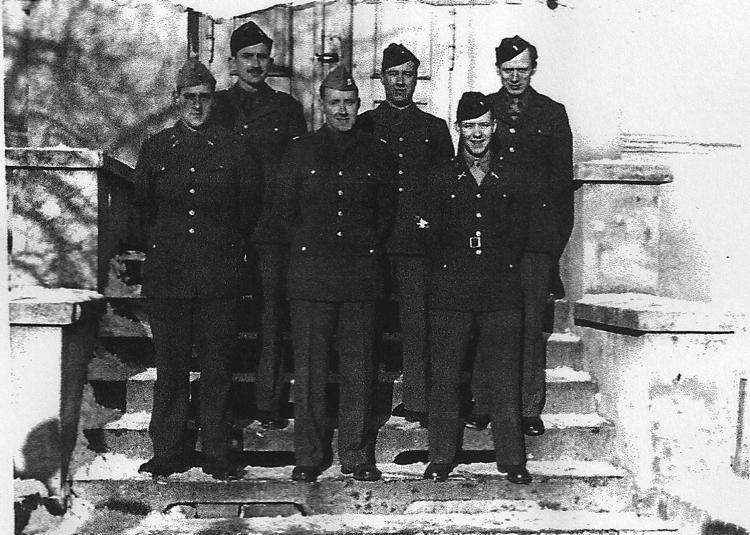 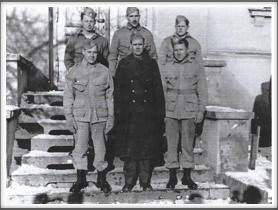 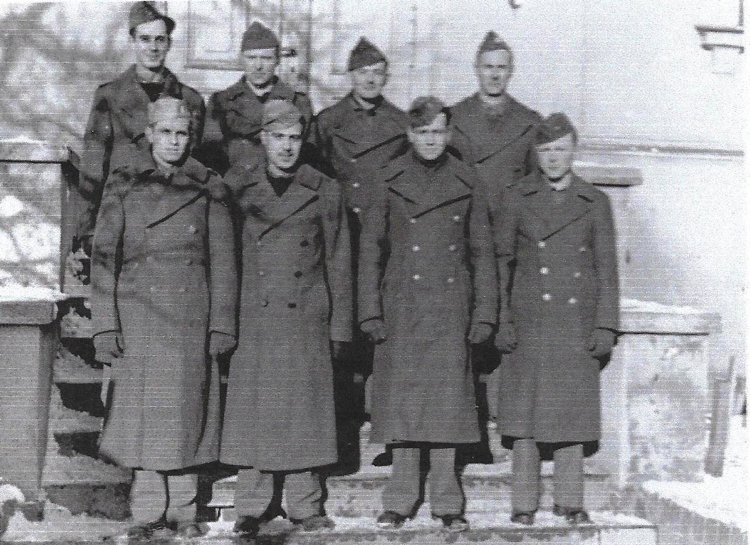 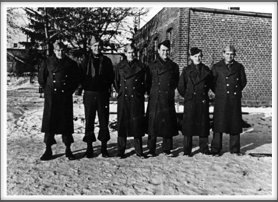 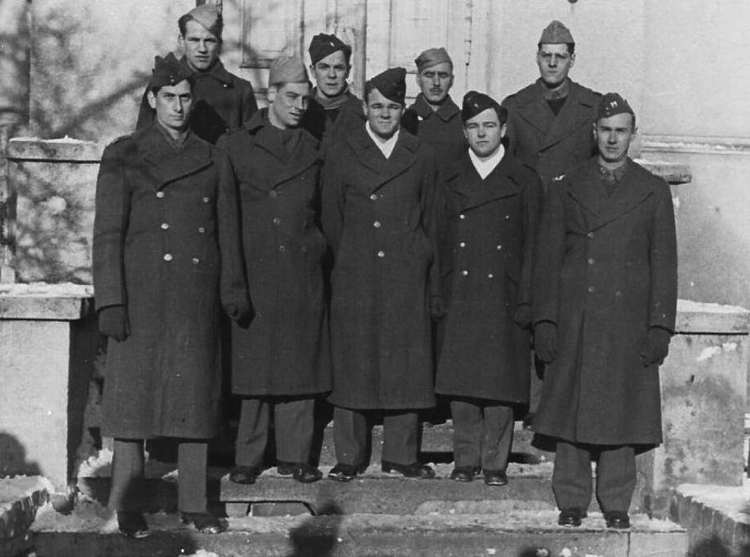 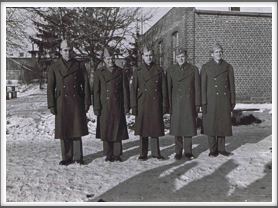 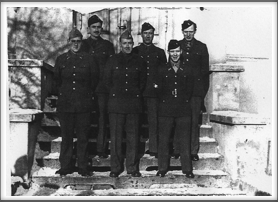 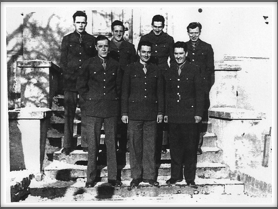 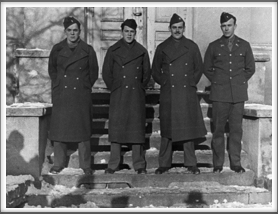 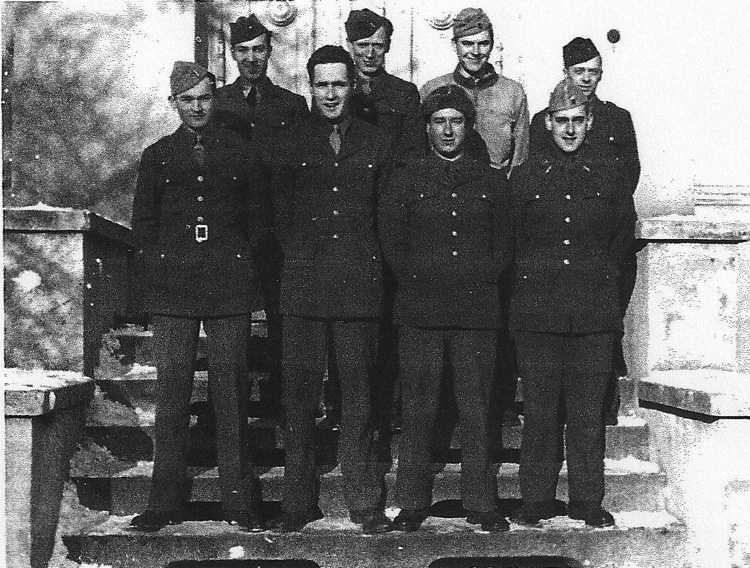 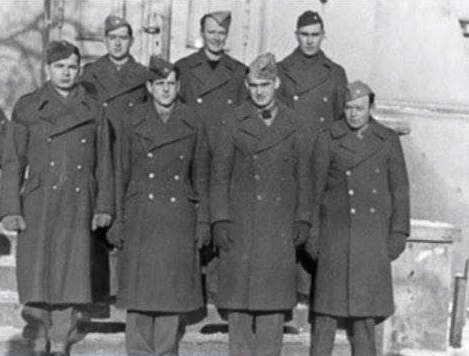 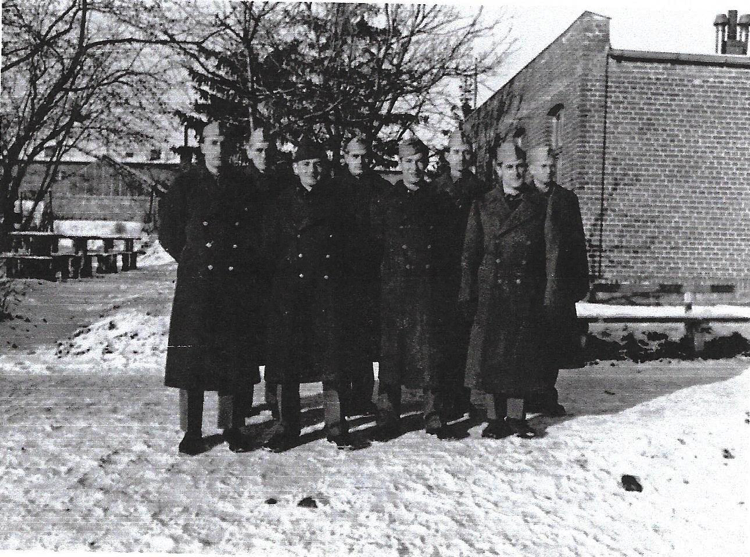 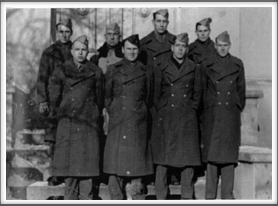 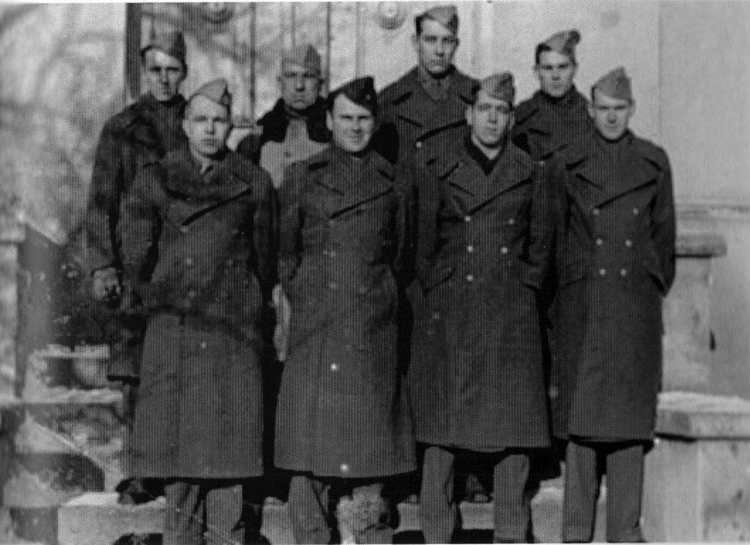 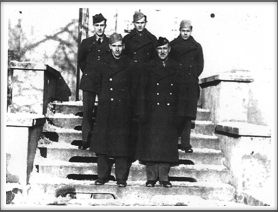 Front l-r: Charles Dunn, Secor, Roy Chappell, William Higgins, Harold Craft; Back l-r: John Glendinning, Jim MacArevey, Murphy, Russell Bissman. 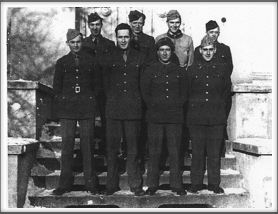 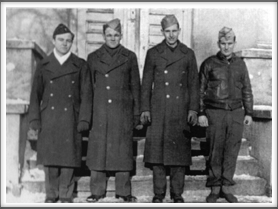 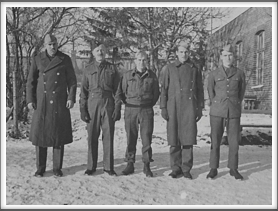 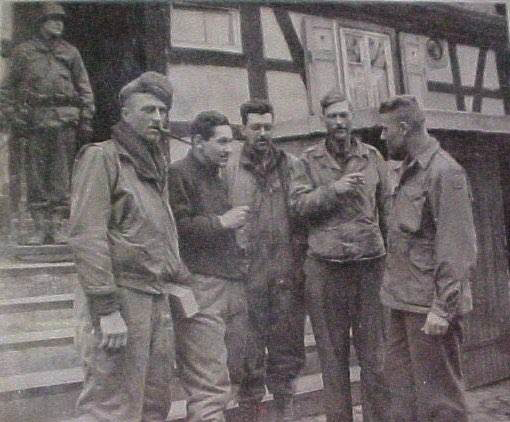 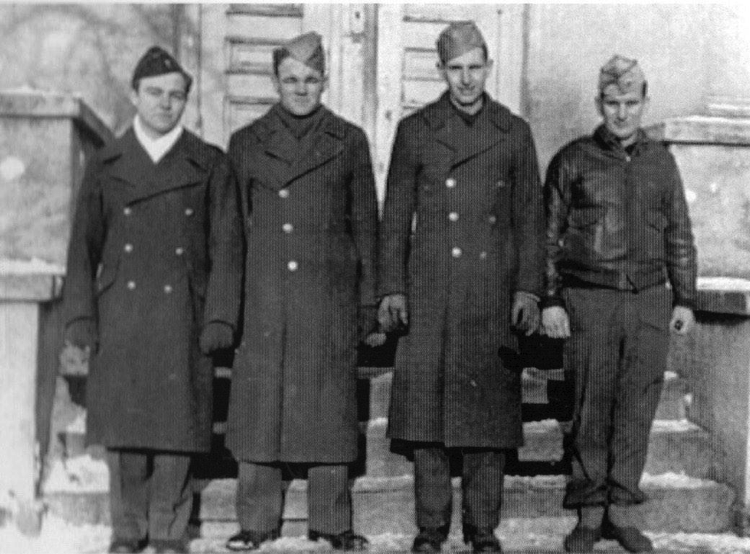 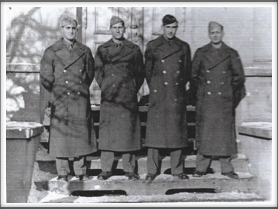 l-r: Robert Lee “Bucky” Walters, “Pappy” Hunsinger, George Lucey, James Fraser, Adrian White, ??? 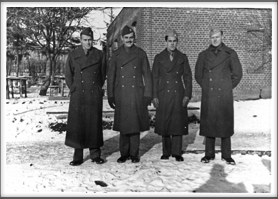 l-r: George Durgin, ?? 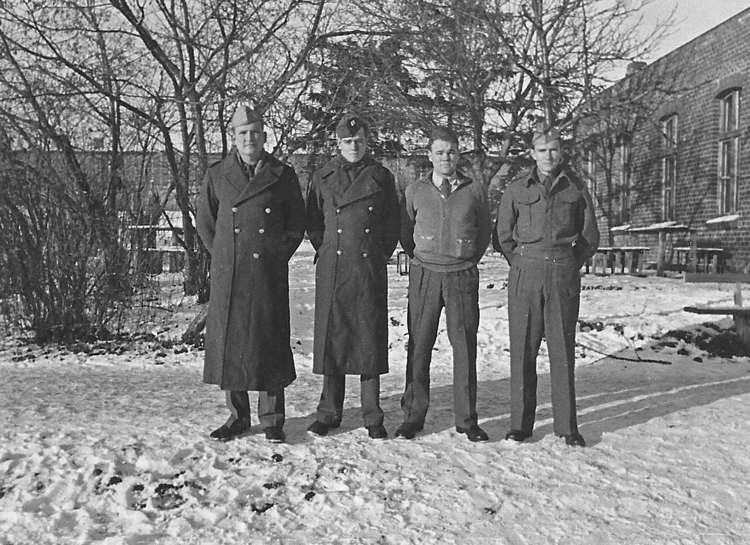 ?, Russell Ford, Lou Otterbein, ??? 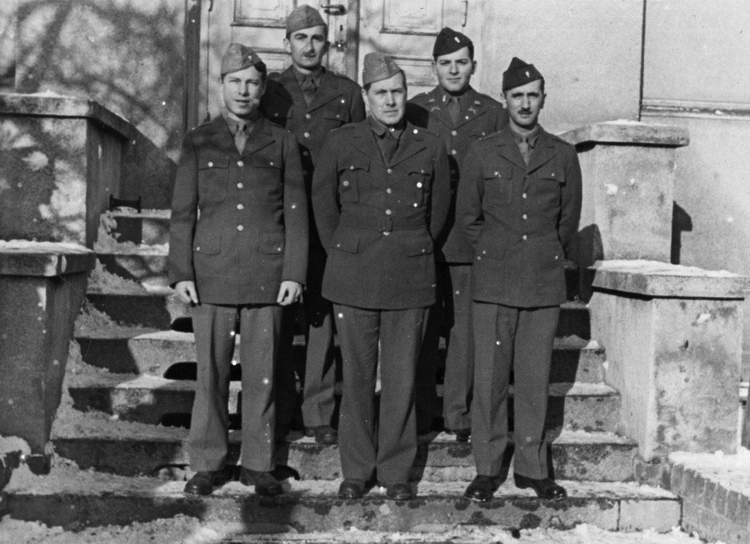 l-r: Jim McArevey, ?? 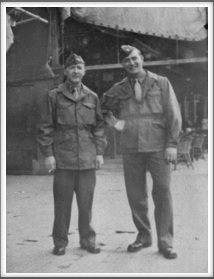 ?, Robert Lee “Bucky” Walters, ??? 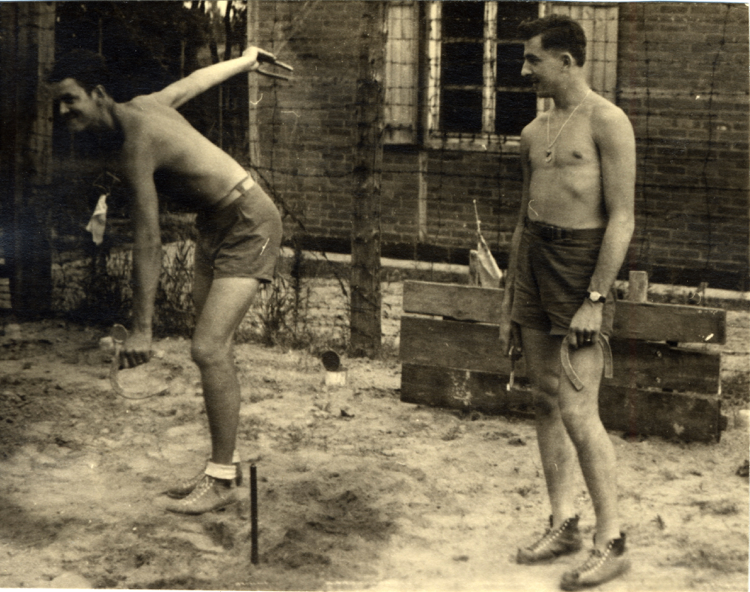 Donald Hunker (r) and friend. 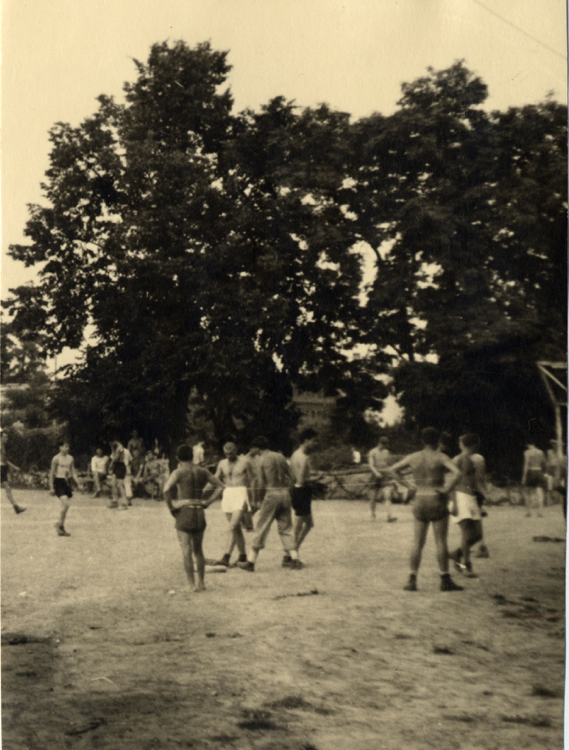 Unknown date/place. 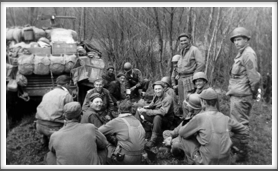 Boo Nunnally, sitting just below the B16 marker on the vehicle. 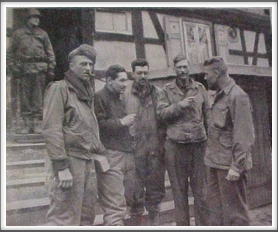 Patrick Ward, just over Boo's left shoulder being handed a cup. 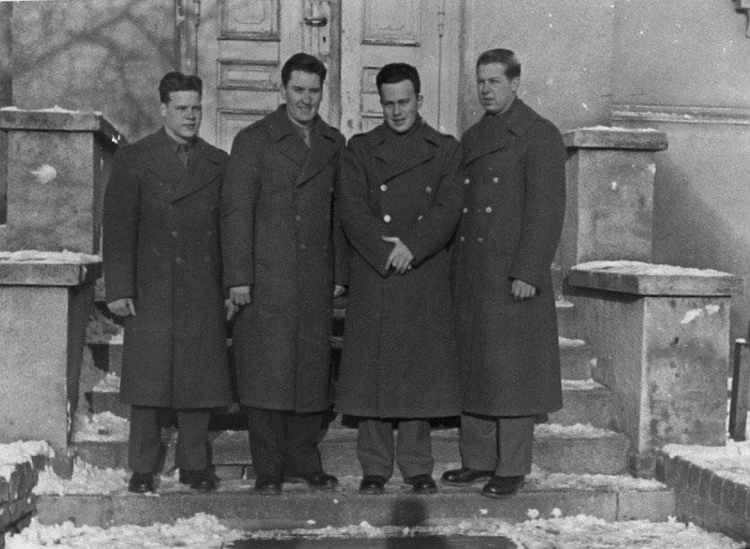 Thomas Morton, middle with a spoon in his left hand. 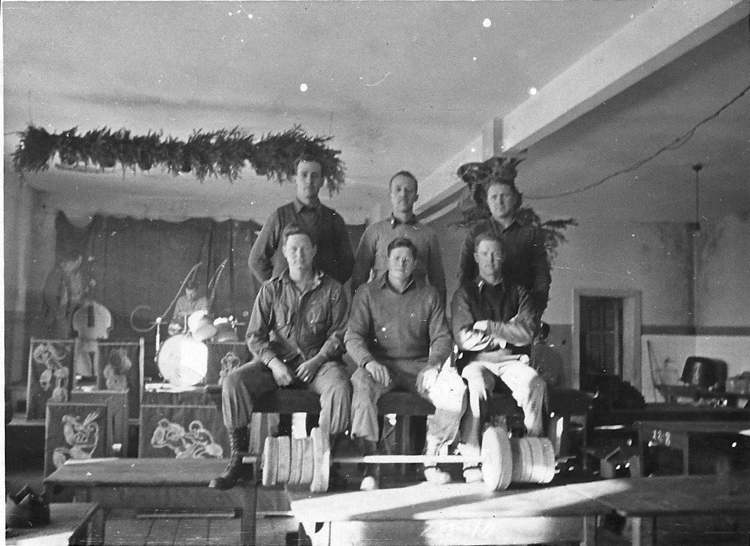 Carl Hansen, in front of Boo wearing glasses.